The new year was heralded by a week of record low daily ice extents, with the January average beating out 2017 for a new record low. Ice grew through the month at near-average rates, and in the middle of the month daily extents were higher than for 2017. 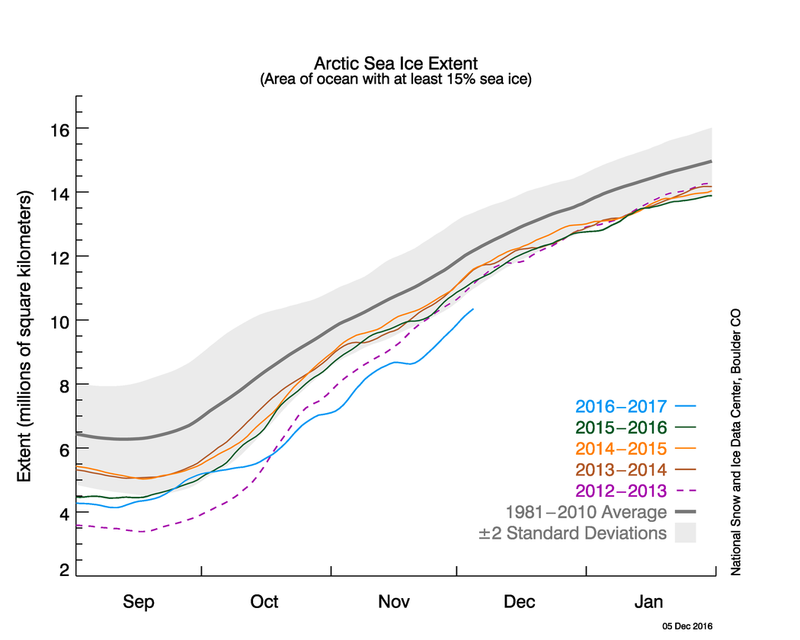 However, by the end of January, extent was again tracking below 2017. The monthly average extent of 13.06 million square kilometers (5.04 million square miles) was 1.36 million square kilometers (525,000 square miles) below the 1981 to 2010 average, and 110,000 square kilometers (42,500 square miles) below the previous record low monthly average in 2017. The pattern seen in previous months continued, with below average extent in the Barents and Kara Seas, as well as within the Bering Sea. 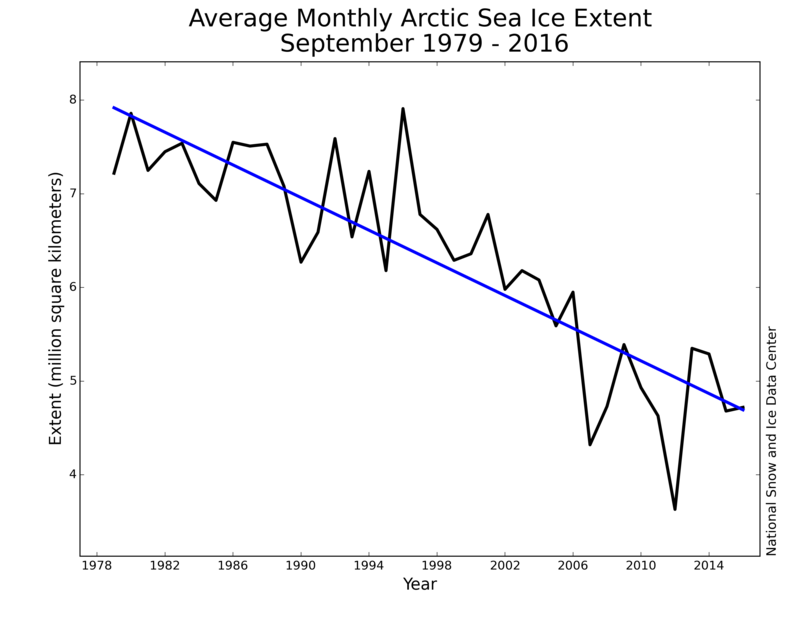 The ice edge remained nearly constant throughout the month within the Barents Sea, and slightly retreated in the East Greenland Sea. By contrast, extent increased in the Gulf of St. Lawrence, off the coast of Newfoundland, in the eastern Bering Sea and the Sea of Okhotsk. 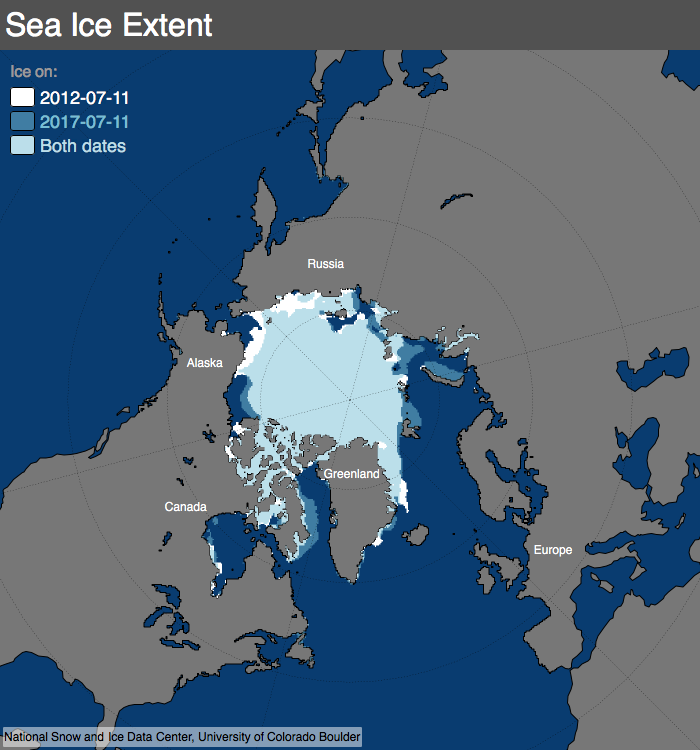 Compared to 2017, at the end of the month, ice was less extensive in the western Bering Sea, the Sea of Okhotsk and north of Svalbard, more extensive in the eastern Bering Sea and in the Gulf of St. Lawrence. Overall, the Arctic gained 1.42 million square kilometers (548,000 square miles) of ice during January 2018. Figure 2a. The graph above shows Arctic sea ice extent as of February 5, 2018, along with daily ice extent data for five previous years. 2017 to 2018 is shown in blue, 2016 to 2017 in green, 2015 to 2016 in orange, 2014 to 2015 in brown, 2013 to 2014 in purple, and 2012 to 2013 in dotted brown. The 1981 to 2010 median is in dark gray. The gray areas around the median line show the interquartile and interdecile ranges of the data. Sea Ice Index data. Figure 2b. The plot shows air temperatures in degrees Celsius in the Arctic as difference from average for January 2018. Yellows, oranges, and reds indicate higher than average temperatures; blues and purples indicate lower than average temperatures. 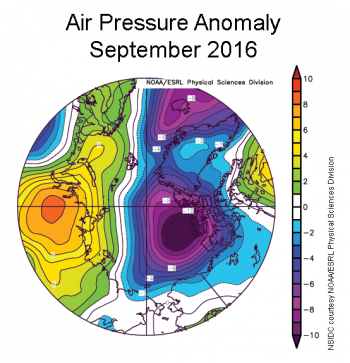 Air temperatures at the 925 hPa level (about 2,500 feet above sea level) remained unusually high over the Arctic Ocean (Figure 2b). Nearly all of the region was at least 3 degrees Celsius (5 degrees Fahrenheit) or more above average. The largest departures from average of more than 9 degrees Celsius (16 degrees Fahrenheit) were over the Kara and Barents Seas, centered near Svalbard. On the Pacific side, air temperatures were about 5 degrees Celsius (9 degrees Fahrenheit) above average. By contrast, 925 hPa temperatures over Siberia were up to 4 degrees Celsius (7 degrees Fahrenheit) below average. The warmth over the Arctic Ocean appears to result partly from a pattern of atmospheric circulation bringing in southerly air, and partly from the release of heat into the atmosphere from open water areas. Sea level pressure was higher than average over the central Arctic Ocean, stretching towards Siberia. This pattern, coupled with below average sea level pressure over the Chukchi and Bering seas, helped to move warm air from Eurasia over the central Arctic Ocean. Ice growth for January averaged 37,000 square kilometers (14,000 square miles) per day, close to the average rate for the month of 42,700 square kilometers per day (16,486 square miles per day). In the Barents Sea, the ice extent was the second lowest during the satellite data record. Ice conditions in this region of the Arctic are increasingly viewed as important in having downstream effects on atmospheric circulation. These proposed links include northward expansion of the Siberian High and cooling over northern Eurasia. Figure 3. 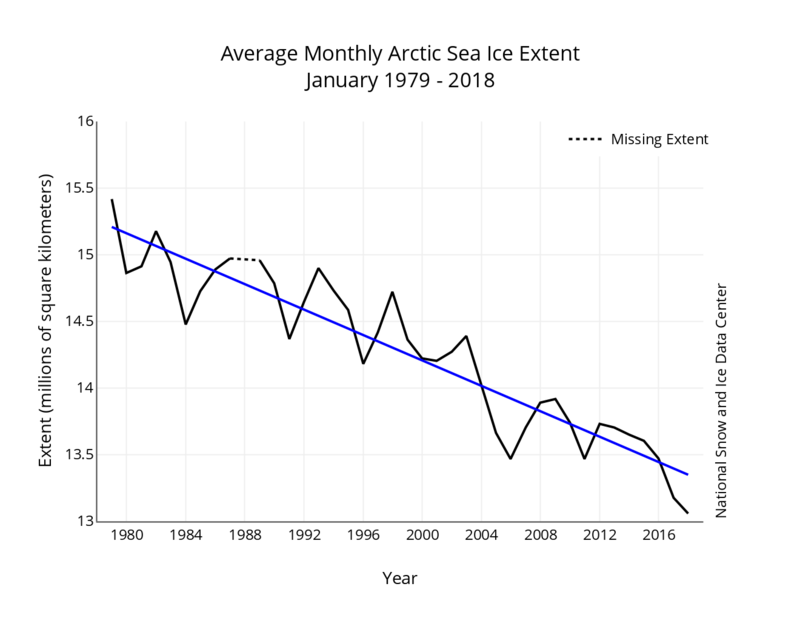 Monthly January ice extent for 1979 to 2018 shows a decline of 3.3 percent per decade. The linear rate of decline for January is 47,700 square kilometers (18,400 square miles) per year, or 3.3 percent per decade. Figure 4. 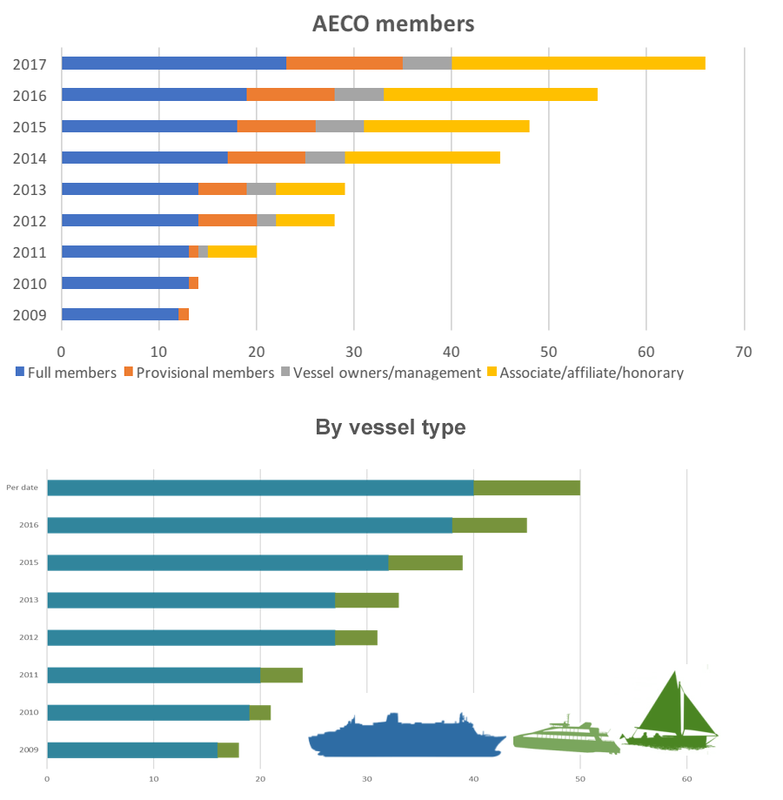 These graphs show changes in polar tourism based on membership in the Association of Arctic Expedition Cruise Operators (AECO, top), and by the number and type of Arctic vessels operated or managed (bottom). Uncertainty about future sea ice conditions presents challenges to industry, policymakers, and planners responsible for economic, safety, and risk mitigation decisions. The ability to accurately forecast the extent and duration of sea ice on different timescales is relevant to a wide range of Arctic maritime activities. While there have been considerable advances in sea ice forecasting over the past decade, it remains unclear how well end users are able to utilize these products and services in their planning. In response, the Sea Ice Prediction Network, in collaboration with several sponsors, held a workshop at the Arctic Frontiers Conference in Tromsø, Norway to foster dialogue between stakeholders and sea ice forecasters. Conference attendees recognized that the sea ice forecasting community and users of these forecasts need a common language. Often forecast users do not understand the data presented by forecasters, nor do they have the skills to interpret the complex data products. Most marine operators in the Arctic require accurate daily to short-term (< 72 hours) information on the sea ice edge and near-ice-edge concentration. Forecast users often want additional information such as ice strength, ice thickness and ice drift. 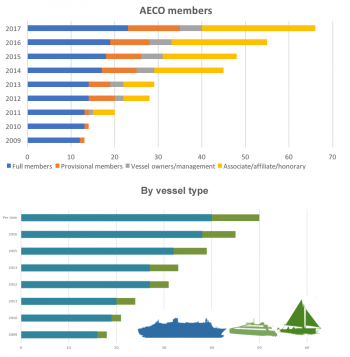 These data need to be accessed in a user-friendly format that can be easily downloaded (e.g., to a ship at sea). 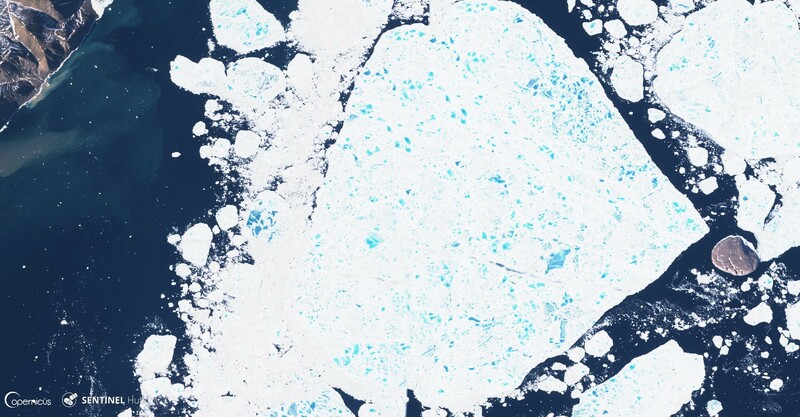 Typically, ice charts from national ice centers or high-resolution Synthetic Aperture Radar image maps are used for describing and analyzing sea ice for real-time navigation. 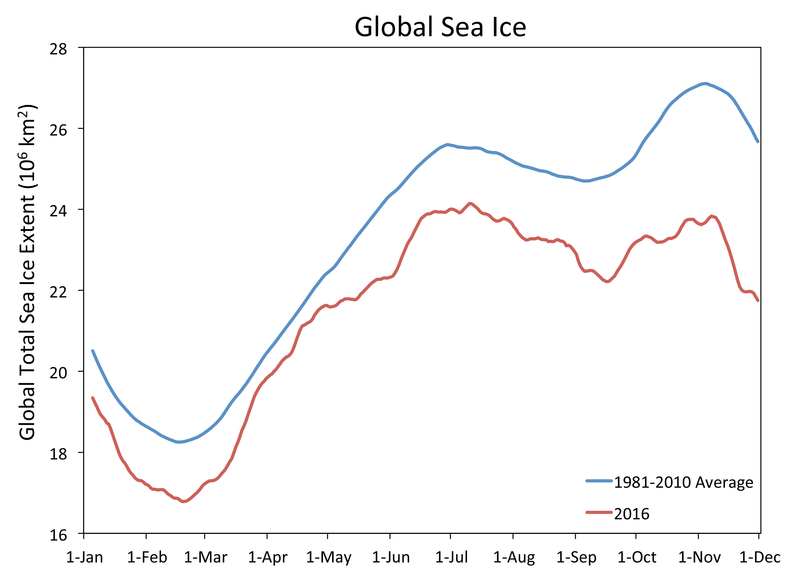 Longer-term seasonal ice forecasts are potentially useful to the polar marine industry but are not yet being relied upon. While improving, the uncertainty in these forecasts has not been clearly communicated. Nevertheless, logistics planners are interested in using longer-term forecasts, mostly to augment or extend more timely data or in-house diagnostics. Tour operators in particular desire seasonal and even two- to three-year forecasts so that they can plan what to offer their customers. Along with the increase in polar tourism (Figure 4), there is also significant industry traffic in the European Arctic, the Northwest Passage and some areas in the Northern Sea Route. Due to the decreasing ice cover, we can expect an extension of the seasonal activity, with ships embarking earlier and ending their journeys later than in previous years. This underscores the need for accurate forecasting, extending to the more variable shoulder seasons of Arctic sea ice. Figure 5. 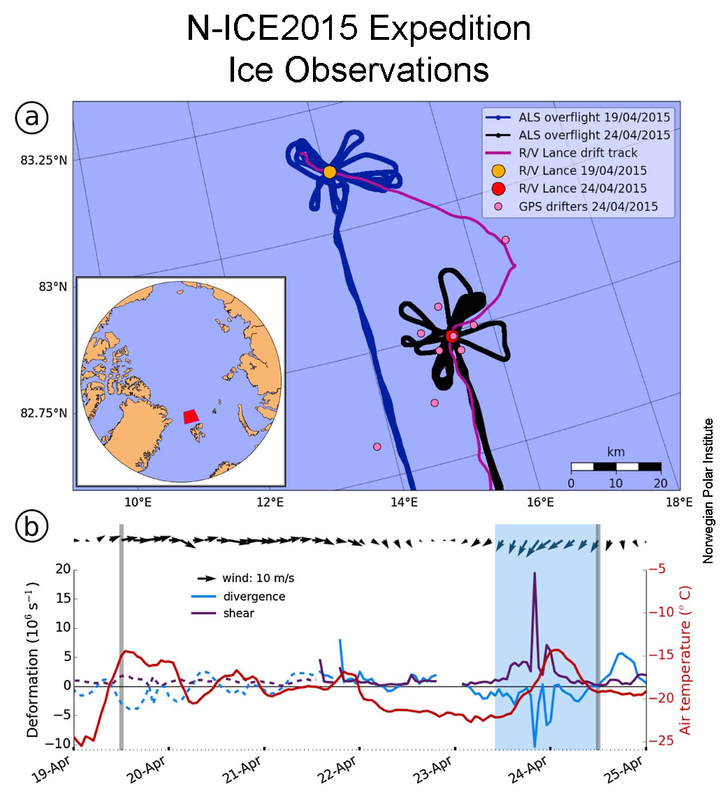 The top figure shows the location of the R/V Lance during the N-ICE2015 expedition (pink lines) with aircraft flight lines shown in black and blue. The bottom figure shows a time series of wind speed and direction, together with rates of ice divergence (blue line) and shear (purple line). Figure from Itkin et al. 2017. As the Arctic sea ice cover continues to thin, convergent sea ice motion can more readily pile up ice into large ridges. Such ridges can be hazardous to marine activities in the Arctic. Divergent ice motion produces openings in the ice called leads, where new ice can readily grow. Winds are the main driver for both ridging and lead formation. A single storm event can lead to significant redistribution of sea ice mass through ridging and new leads. As part of the Norwegian Young Sea ICE (N-ICE2015) expedition, colleagues at the Norwegian Polar Institute made detailed sea ice thickness and ice drift observations before and after a storm in an area north of Svalbard (Figure 5). Results showed that about 1.3 percent of the level sea ice volume was pressed together into ridges. 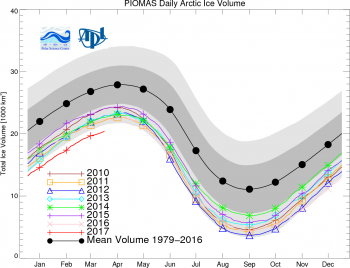 Combined with new ice formation in leads, the overall ice volume increased by 0.5 percent. While this is a small number, sea ice in the North Atlantic is typically impacted by 10 to 20 storms each winter, which could account for 5 to 10 percent of ice volume each year. In the Southern Hemisphere, after January 11 sea ice began tracking low, leading to a January average extent that was the second lowest on record. The lowest extent for this time of year was in 2017. Extent is below average in the Ross Sea and the West Amundsen Seas, while elsewhere extent remains close to average. The low ice extent is puzzling, given that air temperatures at the 925 hPa level are near average or below average (relative to the 1981 to 2010 period) over much of the Southern Ocean. The Weddell and Amundsen Seas were 1 to 2 degrees Celsius (2 to 4 degrees Fahrenheit) below average. 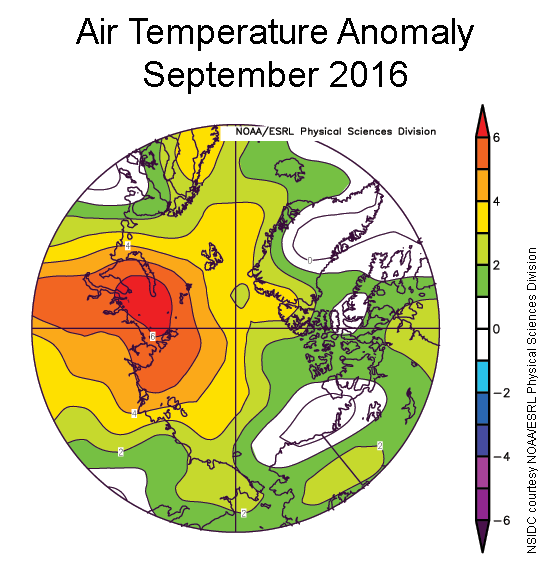 Slightly above-average temperatures were the rule in the northwestern Ross Sea. Itkin, P., Spreen, G., Hvidegaard, S. M., Skourup, H., Wilkinson, J., Gerland, S., & Granskog, M. A. 2018. 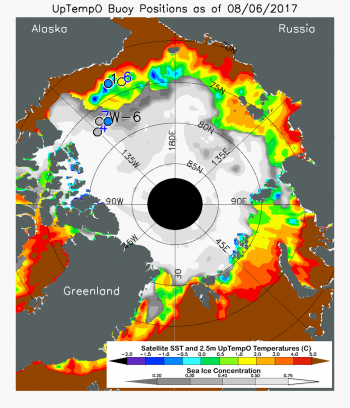 Contribution of deformation to sea ice mass balance: A case study from an N-ICE2015 storm. Geophysical Research Letters, 45. https://doi.org/10.1002/2017GL076056. November 2017 will be remembered not for total Arctic ice extent, which was the third lowest recorded over the period of satellite observations, but for the record low extent in the Chukchi Sea. 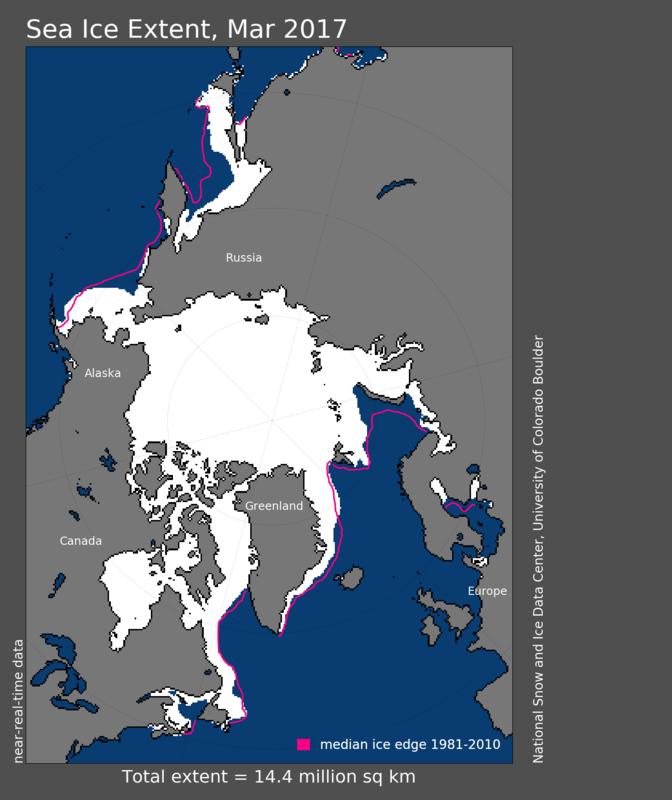 This is a key area for Arctic Ocean access, and is an indicator of oceanographic influences on sea ice extent. 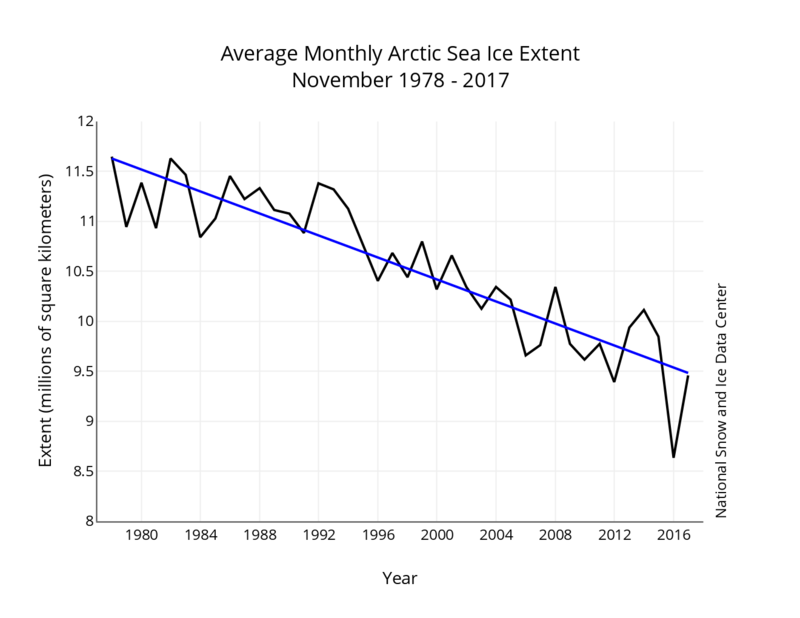 Arctic sea ice extent for November 2017 averaged 9.46 million square kilometers (3.65 million square miles), the third lowest in the 1979 to 2017 satellite record. This was 1.24 million square kilometers (479,000 square miles) below the 1981 to 2010 average and 830,000 square kilometers (321,000 square miles) above the record low November extent recorded in 2016. Extent at the end of the month was below average over the Atlantic side of the Arctic, primarily in the Barents and Kara Seas, slightly above average in western Hudson Bay, but far below average in the Chukchi Sea. This continues a pattern of below-average extent in this region that has persisted for the last year. Figure 2. 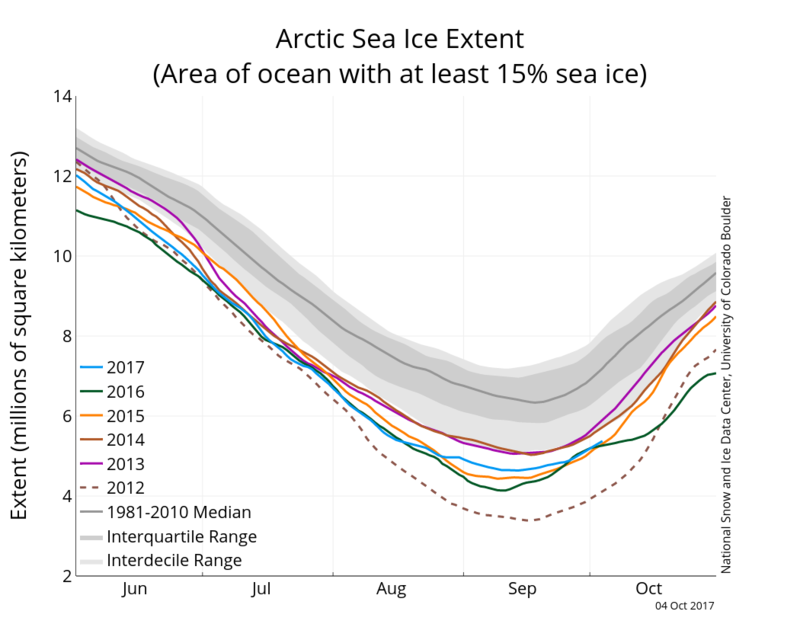 The graph above shows Arctic sea ice extent as of December 3, 2017, along with daily ice extent data for five previous years. 2017 is shown in blue, 2016 in green, 2015 in orange, 2014 in brown, 2013 in purple, and 2012 in dotted red. The 1981 to 2010 median is in dark gray. The gray areas around the median line show the interquartile and interdecile ranges of the data. Sea Ice Index data. Ice growth during November 2017 averaged 80,100 square kilometers (30,900 square miles) per day. This was stronger than the average rate for the month of 69,600 square kilometers (26,900 square miles) per day. Ice growth was particularly rapid within Hudson Bay, Baffin Bay, and the Kara Sea. November air temperatures at 925 hPa (about 3,000 feet above sea level) were above average over essentially all of the Arctic Ocean, with prominent warm spots (more than 6 degrees Celsius, or 11 degrees Fahrenheit above the 1981 to 2010 average) over the Chukchi Sea and north of Svalbard. The unusual warmth in the Chukchi Sea at least in part manifests the extensive open water in this region, but a pattern of winds blowing in from the southwest also appears to have had an influence. The warmth north of Svalbard is more clearly related to the average pattern of atmospheric circulation over the month, with an area of low pressure centered over the Norwegian Sea and an area of high pressure centered north of the Taymyr Peninsula combining to transport warm air into the region. Figure 3. Monthly November ice extent for 1979 to 2017 shows a decline of 5.14 percent per decade. 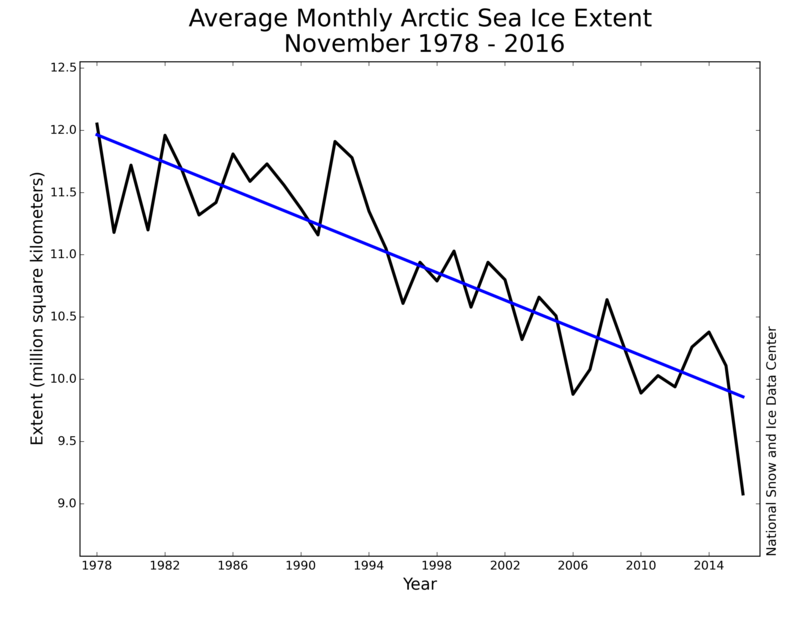 The linear rate of sea ice decline for November is 55,000 square kilometers (21,200 square miles) per year, or 5.14 percent per decade. Recall from our previous post that NSIDC recently revised the way in which monthly average extents are computed, which has minor impacts on computed trends. Figure 4. The map at top shows an analysis of sea ice concentration on November 30, 2017 in the area of the Bering and Chukchi Seas. The graph at bottom shows the combined sea ice concentration from 1978 to 2017, based on Sea Ice Index data. Based on an analysis by Rick Thoman of the NOAA National Weather Service, as of 19 November, ice extent in the combined Beaufort and Chukchi Seas sector was the lowest ever observed in the sea ice record (Figure 4). This was largely driven by the lack of sea ice within the Chukchi Sea. By the end of November, the Beaufort Sea was completely ice-covered. The NOAA analysis makes use of the NSIDC Sea Ice Index data set. As discussed in our June 7 post, the current state of the ice cover in this region likely has its origin as far back as last year, when warm conditions favored the persistence of open water in the Chukchi Sea into December of 2016. Strong winds from the north occurred for a few days at the end of March and early April, pushing ice southward in the Bering Sea, breaking up the ice in the Chukchi Sea, and even flushing some ice out through the Bering Strait. We also suggested a possible role of a strong oceanic heat inflow to the Chukchi Sea via Bering Strait. In support of this view, in the summer of 2017, Rebecca Woodgate of the University of Washington, Seattle, sailing on the research vessel Norseman II, recovered mooring data that indicated an early arrival of warm ocean water in the strait, about a month earlier than the average. This resulted in June ocean temperatures that were 3 degrees Celsius (5 degrees Fahrenheit) above average. Higher ocean temperatures in summer plays a large role in the timing of when the ice will form again in winter. There is likely a considerable amount of heat remaining in the top layer of the ocean, which will need to be lost to the atmosphere and outer space before the region becomes fully ice covered. Figure 5a. 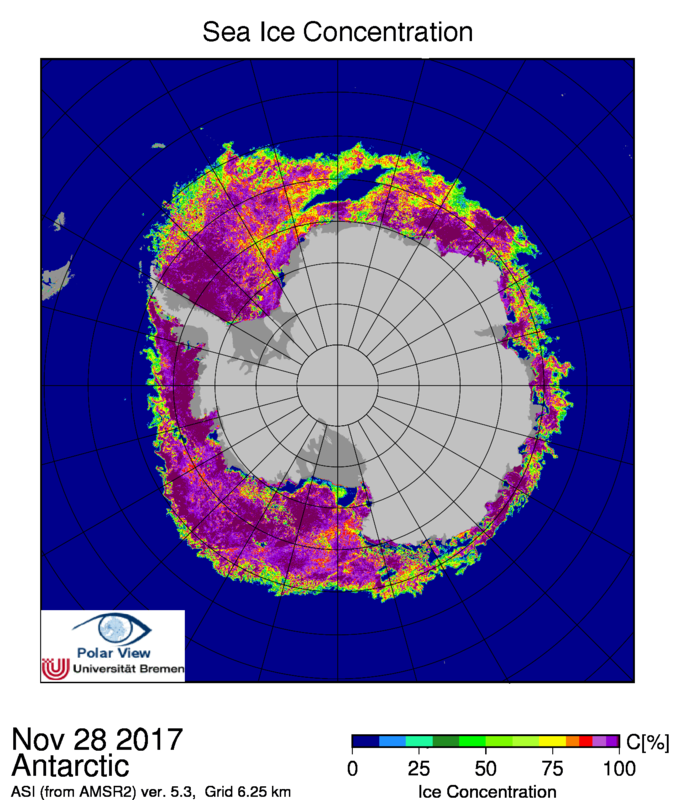 Antarctic sea ice concentration from AMSR2, in percent, for November 28, 2017. The Maud Rise polynya is seen at top. Figure 5b. Small tabular icebergs are seen in the marginal ice zone of the northern Weddell Sea on November 22, 2017 during a NASA Operation IceBridge flight. 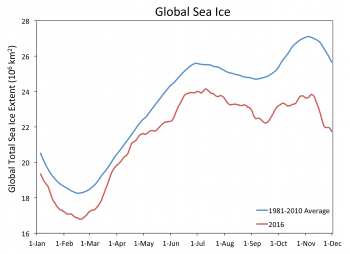 In the Southern Hemisphere, where it is late spring, sea ice declined at a faster-than-average pace after the very late-season October 12 maximum extent. This led to the third-lowest November average monthly extent in the satellite record, behind 1986 and 2016. Sea ice extent was near-average in all regions except the Weddell Sea, where extent is at a satellite-era record low. The atmospheric circulation for November exhibited a very strong wave-3 pattern. In a wave-3 pattern, there are three major low-pressure areas around the continent separated by three high-pressure areas. Air temperatures for the month were near-average in most regions except for the eastern Weddell Sea, consistent with the reduced sea ice extent there. The Maud Rise Polynya (Figure 5a) continued to grow through November, as increased sunshine and air temperatures allowed the upwelling warm water to expand the opening in the floating sea ice cover. At the beginning of December, retreat of the sea ice edge converted the polynya to a large embayment in the sea ice cover. A cooler than average first half of the month kept ice loss at a sluggish pace with little change in the ice edge within the eastern Arctic. Retreat was mostly confined to the western Beaufort and northern Chukchi seas. 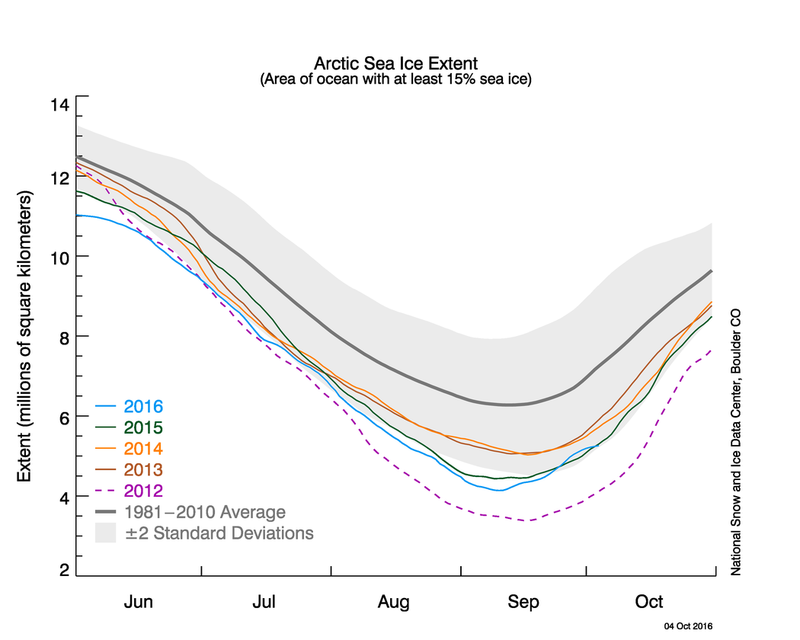 Ice extent remains above that seen in 2012 and 2007. 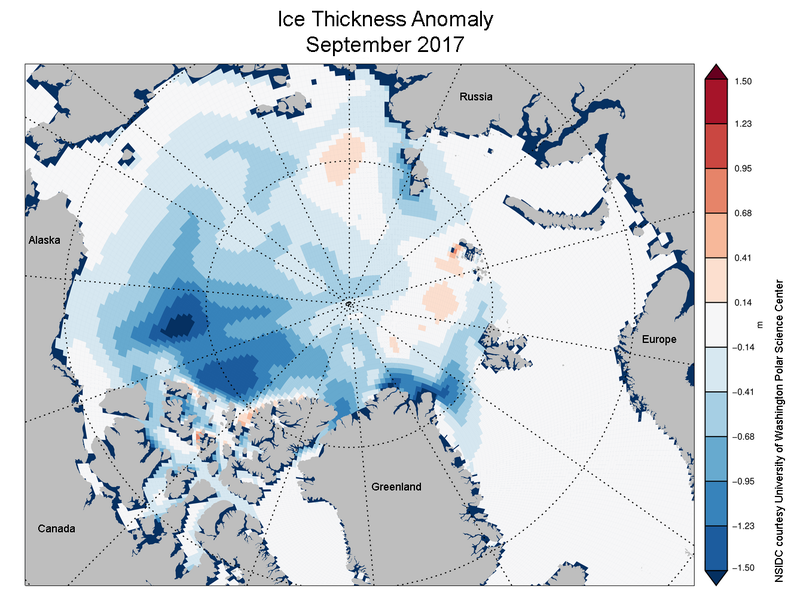 On August 21, 2017, ice extent stood at 5.27 million square kilometers (2.03 million square miles). This was 1.82 million square kilometers (703,000 square miles) below the 1981 to 2010 median extent for the same day, and 804,000 square kilometers (310,000 square miles) and 221,000 square kilometers (85,000 square miles) above the 2012 and 2007 extents for the same day, respectively. 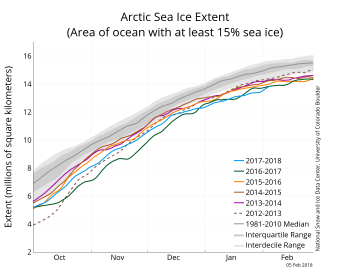 The ice edge remained nearly constant through the first half of the month in the Barents and Kara Seas, and retreated only slightly within the East Greenland Sea. 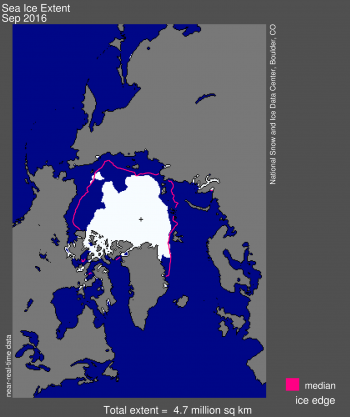 The ice edge also remained stable in the Laptev and East Siberian Seas through the first half of the month. 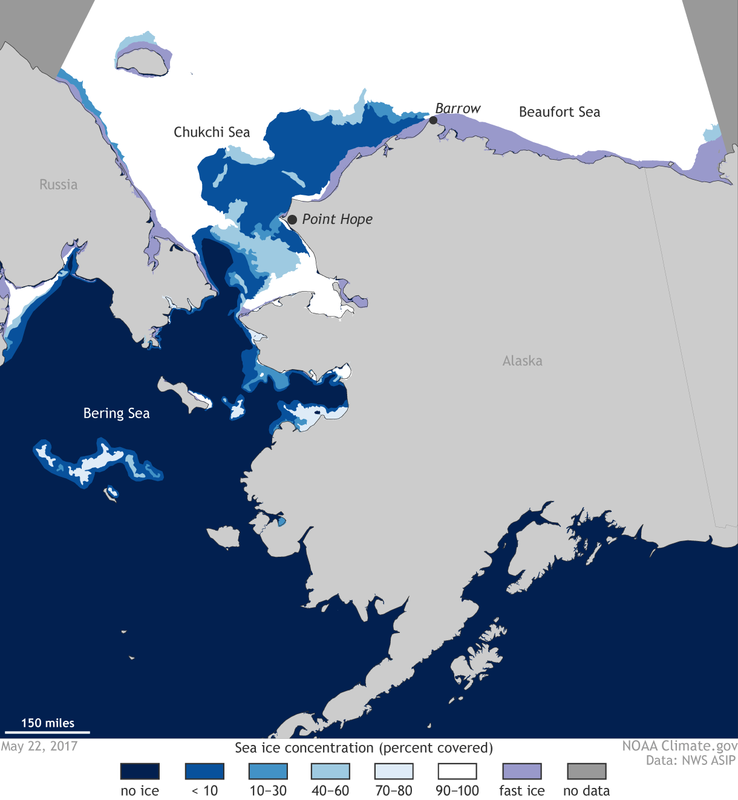 Ice retreat occurred primarily within the Chukchi and western Beaufort Seas as well as near the New Siberian Islands. Some ice continues to block the Northern Sea Route near Severnaya Zemlya. Both McClure Strait and the Amundsen Gulf routes within the Northwest Passage remain blocked by ice. On August 17, the Russian nuclear powered icebreaker 50 let pobedy reached the North Pole in just 79 hours, the fastest time yet. Figure 2. 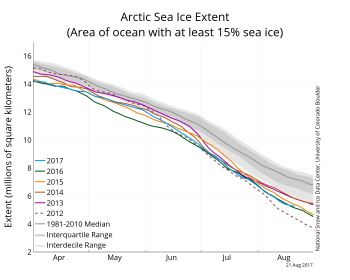 The graph above shows Arctic sea ice extent as of August 21, 2017, along with daily ice extent data for five previous years. 2017 is shown in blue, 2016 in green, 2015 in orange, 2014 in brown, 2013 in purple, and 2012 as a dashed line. The 1981 to 2010 median is in dark gray. The gray areas around the median line show the interquartile and interdecile ranges of the data. Sea Ice Index data. Ice retreat from August 1 to August 21 averaged 73,000 square kilometers (28,000 square miles) per day. This was faster than the 1981 to 2010 average rates of ice loss of 57,300 square kilometers (22,000 square miles) per day, but slower than in 2012, which exhibited the fastest rate of ice loss compared to any other August in the passive microwave satellite data record. Normally the rate of ice retreat slows in August as the sun starts to dip lower in the sky. 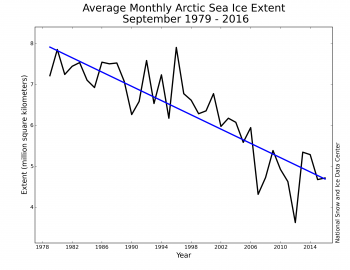 The rate of ice loss was more rapid at the beginning of August, slowing down considerably starting on August 17. Air temperatures the first two weeks of August were 1 to 3 degrees Celsius (2 to 5 degrees Fahrenheit) cooler than the 1981 to 2010 average throughout the Arctic Ocean and over Greenland and the North Atlantic. The lowest air temperatures relative to the long-term average were found in coastal regions of the Kara and Barents Seas, continuing the pattern seen throughout much of this summer. Cooler than average conditions within the Central Arctic were a result of persistent cold-core cyclones. These cyclones have not been as large or as strong as the Great Arctic Cyclones of 2012 and 2016, despite the central pressure of one of these systems dropping down to 974 hPa on August 10. In addition, these cyclones are located closer towards the pole within the consolidated ice pack, where they are less likely to cause significant ice loss, as did the 2012 Great Arctic Cyclone in the Chukchi Sea. While air temperatures start to drop in August, ice melt continues through the month as heat gained in the ocean mixed layer during summer continues to melt the ice from below and from the sides. Sea surface temperatures have been up to 5 degrees Celsius (9 degrees Fahrenheit) above average near the coastal regions, but generally near average or slightly below average along the ice edge in the Beaufort and Chukchi Seas. Figure 3. This photograph, taken during NASA Operation IceBridge on July 25, 2017, shows melt ponds on the surface of Arctic sea ice. NASA’s Operation IceBridge (OIB) airborne campaign flew several missions over the Greenland ice sheet this summer to study changes in Greenland outlet glaciers, as well as to observe sea ice. A recent mission collected laser altimeter data to investigate sea ice thickness changes resulting from the piling up of sea ice (or convergence) as ice motion pushes the ice up against the coast. Flights were completed on July 17 and July 25. High-resolution visible imagery collected on the flights also provides close-up looks of melt pond development. Figure 4. This plot shows measurements of sea surface temperature from drifting buoys, along with satellite-derived sea surface temperature from NOAA and ice concentration from NSIDC for August 6, 2017. Buoy positions as of August 6 are indicated with circles. A gray dot indicates that the buoy is reporting a temperature value outside the range of -2 to 10 degrees Celsius. Red, orange, and yellow indicate higher temperatures, while blues and purples indicate lower temperatures. Whites indicate higher sea ice concentration, and grays indicate lower concentration. 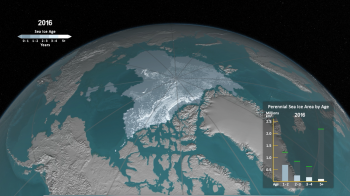 This May, sea ice in the Chukchi Sea was at a record low for the satellite data record. The early retreat of ice in this region may partially be a result of unusually warm ocean temperatures in the region. As reported by Rebecca Woodgate of the University of Washington, Seattle, the Research Vessel Norseman II spent eight days in the Bering Strait and southern Chukchi Sea region to recover oceanographic moorings and whale acoustic instruments, in addition to deploying new instruments. The mooring data indicated early arrival of warm water in the strait, about a month earlier than the average, resulting in June ocean temperatures that were 3 degrees Celsius (5 degrees Fahrenheit) above average. Early intrusion of warm water in the Bering Strait back in May helped to melt sea ice from below, and may have been one of the factors for early development of open water in the region. Figure 5. The bar graph, top, shows the Berkeley Earth evaluation of the ten warmest years since 1979 in the Arctic north of 80°N; the plot, middle, shows Arctic average temperatures for the period 1900 to 2016, relative to a 1951 to 1980 reference period; bottom, a map of Arctic temperature differences, in degrees Celsius, for the 2012 to 2016 period (5 years) relative to a 1981 to 2010 reference period. Our past reports, and many other sources, have noted that the Arctic region is warming faster than the rest of the globe. This warming has accelerated in recent years, particularly since 2005. The ten warmest years on record for the Arctic are within the past twelve years, and 2016 was by far the warmest in the record since 1900. These observations are supported by both NOAA National Centers for Environmental Prediction (NCEP) reanalysis climate data, and by our colleagues at Berkeley Earth. Berkeley Earth is an independent climate fact- and analysis-checking group dedicated to an objective evaluation of the main claims and data sets used to support climate trends and forecasts. One of the major statements of the recent Paris Climate Accord, dealing with heat-trapping ga reductions, is a target to hold the increase in the global average temperature to well below 2 degrees Celsius (3.6 degrees Fahrenheit) above the pre-industrial average. While this reference for the increase (pre-industrial average) is somewhat ambiguous, using reference average temperatures of either 1951 to 1980 or 1980 to 2010 for the Arctic shows that much of the area north of 80°N is already above this guideline over the past five years (2012 to 2016). As the Arctic will likely continue to warm above 2 degrees Celsius, other areas will need to warm less than that if the threshold is not to be exceeded. In general, land warms about 30 percent faster than oceans in the models, so in a global-average 2 degree Celsius warmer world, much of the global land area would have warmed more than 2 degrees Celsius. 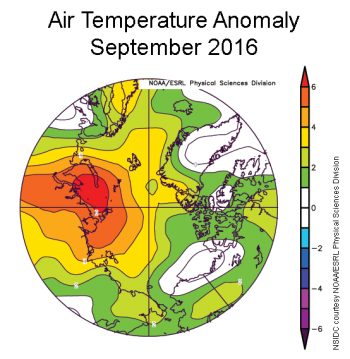 The annual average air temperature for 2016 for the Arctic north of 80°N was more than 3.5 degrees Celsius (6.3 degrees Fahrenheit) above the 1951 to 1980 reference period, the warmest year yet, and most years during the past decade had annual average temperatures between 2 to 2.5 degrees Celsius (3.6 to 4.5 degrees Fahrenheit) above the reference period. Geographically, the NOAA NCEP reanalysis shows that recent warming is primarily located over the Arctic Ocean, and smaller warming trends are seen in the circum-Arctic land areas. Hawkins, E., Ortega, P., Suckling, E., Schurer, A., Hegerl, G., Jones, P., Joshi, M., Osborn, T.J., Masson-Delmotte, V., Mignot, J. and Thorne, P. 2017. Estimating changes in global temperature since the pre-industrial period. Bulletin of the American Meteorological Society, doi:10.1175/BAMS-D-16-0007.1. 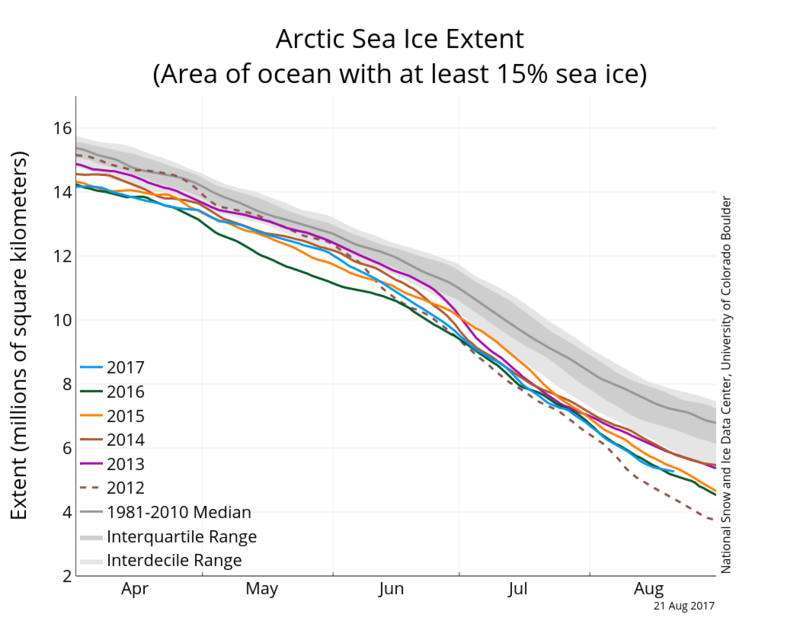 Arctic extent nearly matched 2012 values through the first week of July, but the rate of decline slowed during the second week. 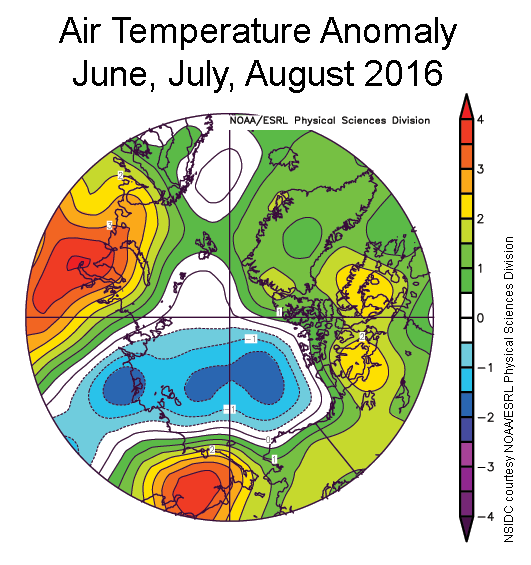 Weather patterns were unremarkable during the first half of July. As of July 17, Arctic sea ice extent stood at 7.88 million square kilometers (3.04 million square miles). This is 1.69 million square kilometers (653,000 square miles) below the 1981 to 2010 average, and 714,000 square kilometers (276,000 million square miles) below the interdecile range. Extent was lower than average over most of the Arctic, except for the East Greenland Sea (Figure 1). Hudson Bay was nearly ice free by mid July, much earlier than is typical, but in line with what has been observed in recent years. Figure 2a. 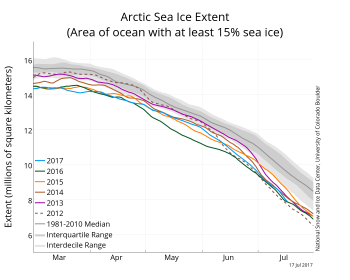 The graph above shows Arctic sea ice extent as of July 17, 2017, along with daily ice extent data for five previous years. 2017 is shown in blue, 2016 in green, 2015 in orange, 2014 in brown, 2013 in purple, and 2012 as a dotted brown line. The 1981 to 2010 median is in dark gray. The gray areas around the median line show the interquartile and interdecile ranges of the data. Sea Ice Index data. Figure 2b. 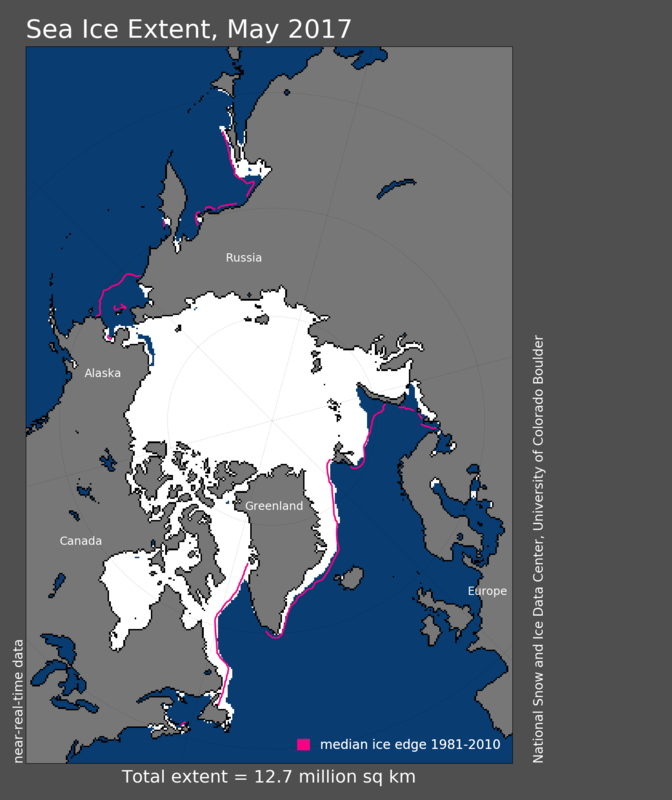 This map compares sea ice extent for July 11 in 2017 and in 2012. White shows where ice occurred only in 2012, medium blue is where ice occurred only in 2017, and light blue is where ice occurred in both years. Through the first week of July, extent closely tracked 2012 levels. The rate of decline then slowed, so that as of July 17, extent was 169,000 square kilometers (65,300 square miles) above 2012 for the same date (Figure 2a). The spatial pattern of ice extent differs from 2012, with less ice in the Chukchi and East Siberian Seas in 2017, but more in the Beaufort, Kara, and Barents Seas and in Baffin Bay (Figure 2b). Figure 3a. 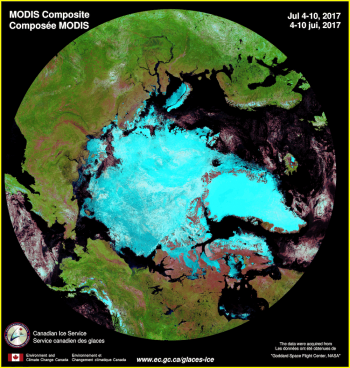 This image from the NASA Moderate Resolution Imaging Spectroradiometer (MODIS) shows sea ice in the Canadian Archipelago on July 3, 2017. 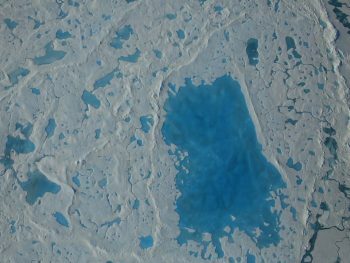 The blue hues indicate areas of widespread melt ponds on the surface of the ice. Figure 3b. The Sentinel-2 satellite captured this image of large sea ice floes in Nares Strait on July 8, 2017. Figure 3c. This false-color composite image of the Arctic is based on NASA MODIS imagery from July 4 to 10. Most clouds are eliminated by using several images over a week, but some clouds remain, particularly over the ocean areas. NSIDC primarily relies on passive microwave data because it provides complete coverage—night and day, and through clouds—and because it is consistent over its long data record. However, other types of satellite data, for example visible imagery from the NASA MODIS instrument on the Aqua and Terra satellites or from the European Space Agency Sentinel 2 satellite, can sometimes provide more detail. When skies clear, details of the ice cover can be seen, including leads, individual ice floes and melt ponds. 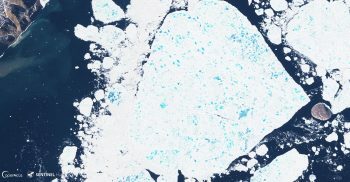 For example, on July 3 in the Canadian Archipelago, 1-kilometer resolution MODIS imagery shows that the ice surface has a distinctive blueish hue due to the presence of melt ponds on the surface (Figure 3a). 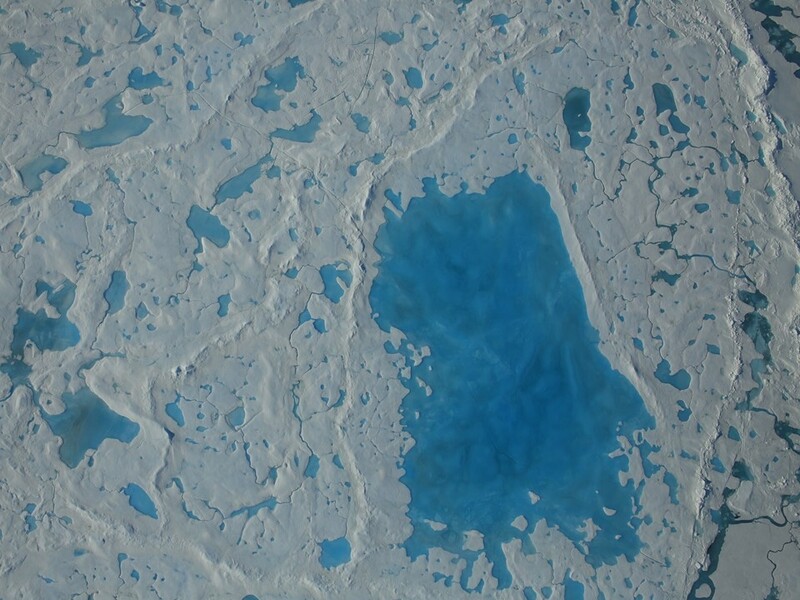 Higher resolution Sentinel-2 imagery (10 meters, Figure 3b) on the other hand provides up close detail on individual melt ponds on the ice floes. The Arctic is a cloudy place, and generally, it is difficult to obtain a clear-sky image of the entire region. However, if images are compiled, or composited, over several days, most of the region may have at least some clear sky. This approach can yield a composite image that is mostly cloud-free. The Canadian Ice Service uses this approach to create a weekly nearly cloud-free composite image of the Arctic (Figure 3c). However, because the ice cover moves (typically several kilometers per day) and melts (during the summer), over the week-long composite period, fine details that can be seen in the daily imagery are not as evident because they have been “smeared” out over the week. In response to diminishing ice extent, the US Navy has been holding a semi-annual symposium to bring together scientists, policy makers, and others to discuss the sea ice changes and their impacts. The seventh Symposium is taking place this week in Washington, DC, and will be attended by NSIDC scientists Mark Serreze, Walt Meier, Florence Fetterer, and Ted Scambos. A new study published this week in Geophysical Research Letters by Robert Graham at the Norwegian Polar Institute shows that warm winters in the Arctic are becoming more frequent and lasting for longer periods of time than they used to. Warm events were defined by when the air temperatures rose above -10 degrees Celsius (14 degrees Fahrenheit). While this is still well below the freezing point, it is 20 degrees Celsius (36 degrees Fahrenheit) higher than average. 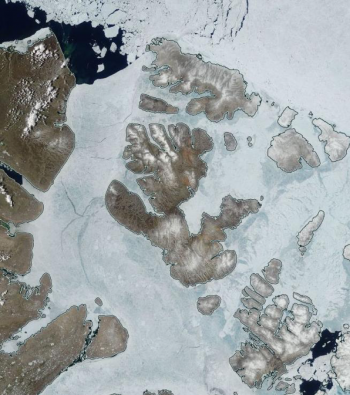 The last two winters have seen temperatures near the North Pole rising to 0 degrees Celsius. While an earlier study showed that winter 2015/2016 was the warmest recorded at that time, the winter of 2016/2017 was even warmer. Graham, R. M., L. Cohen, A. A. Petty, L. N. Boisvert, A. Rinke, S. R. Hudson, M. Nicolaus, and M. A. Granskog. 2017. Increasing frequency and duration of Arctic winter warming events, Geophys. Res. Lett., 44, doi:10.1002/2017GL073395. After setting satellite-era record lows during winter, Arctic sea ice extent declined at a steady but somewhat sluggish pace during May. 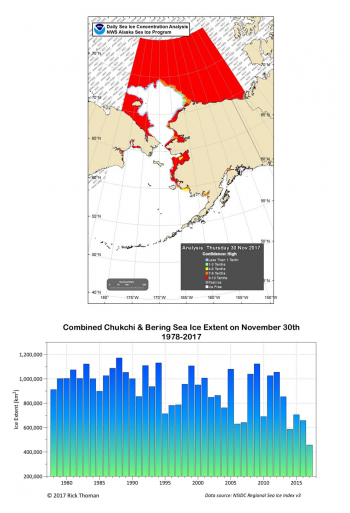 However, ice has retreated at a record rate in the Chukchi Sea, and open water extended to Barrow, Alaska. In the Southern Hemisphere, ice extent continues its seasonal expansion, but extent remains well below the long-term average for this time of year. Arctic sea ice extent for May 2017 averaged 12.74 million square kilometers (4.92 million square miles), the fourth lowest in the 1979 to 2017 satellite record. This contrasts strongly with the past several months, when extent tracked at satellite-era record lows. May 2017 extent was 710,000 square kilometers (274,000 square miles) below the 1981 to 2010 long-term average, and 660,000 square kilometers (255,000 square miles) above the previous record low set in 2016. Sea ice extent remained below average in the Pacific sector of the Arctic and in the Barents Sea, but was slightly above average in Baffin Bay and Davis Strait towards the Labrador Sea. Ice extent was at average levels in the Greenland Sea. 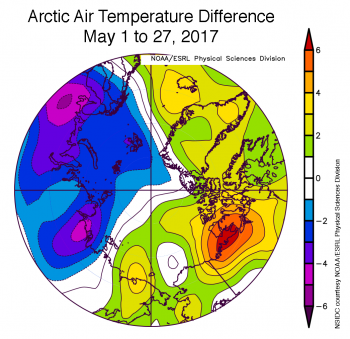 In the Chukchi Sea, extent was at record low levels for May. Figure 2a. 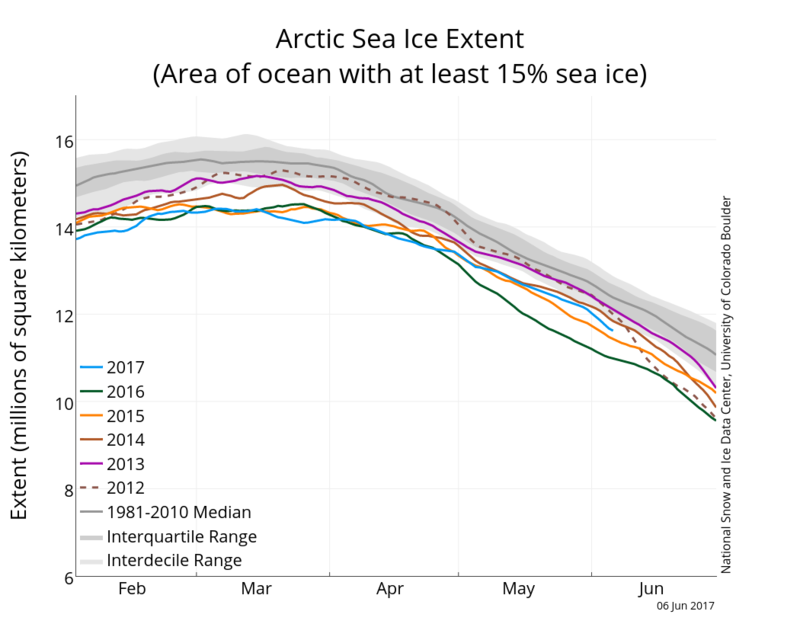 The graph above shows Arctic sea ice extent as of June 6, 2017, along with daily ice extent data for five previous years. 2017 is shown in blue, 2016 in green, 2015 in orange, 2014 in brown, 2013 in purple, and 2012, the record low year, as a dashed line. The 1981 to 2010 median is in dark gray. The gray areas around the median line show the interquartile and interdecile ranges of the data. Sea Ice Index data. Figure 2b. 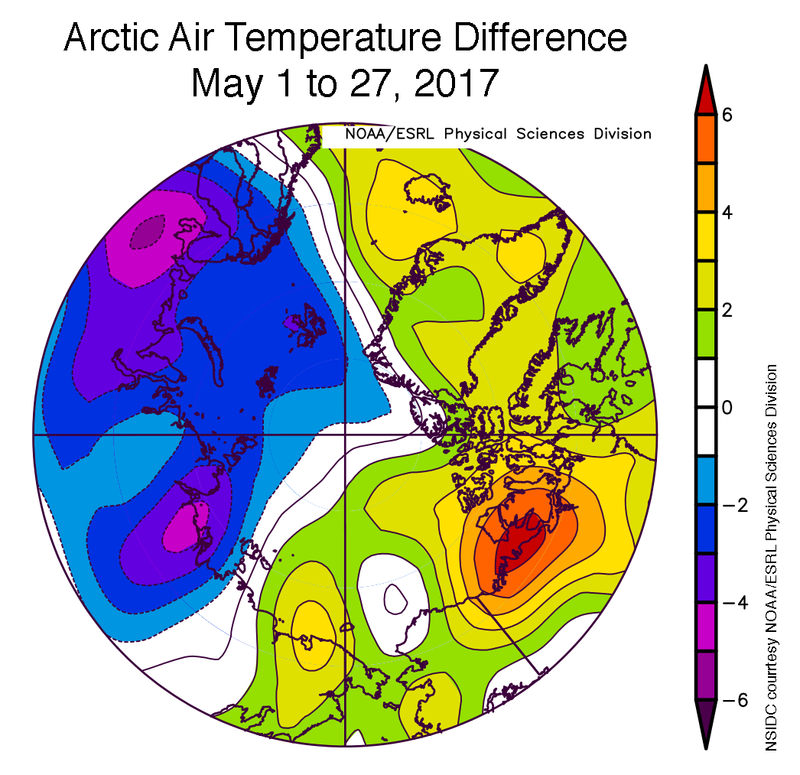 The plot shows differences from average for Arctic air temperatures from May 1 to 27, 2017 at the 925 hPa level (about 2,500 feet above sea level) in degrees Celsius. Yellows and reds indicate higher than average temperatures; blues and purples indicate lower than average temperatures. 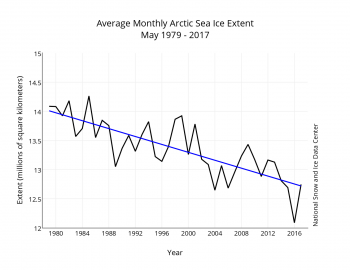 For the Arctic as a whole, the rate of decline in Arctic sea ice extent through May was relatively slow. The May 2017 rate of decline was 42,800 square kilometers (16,500 square miles) per day, compared to the 1981 to 2010 average of 46,990 square kilometers (18,143 square miles) per day. Sea ice was especially slow to retreat in the Atlantic sector of the Arctic, with little change in the ice edge in Baffin Bay and Davis Strait. 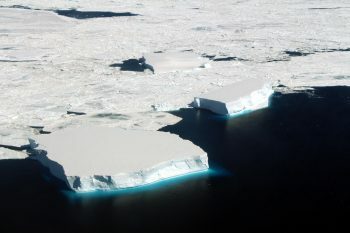 The ice edge expanded in the Barents and Greenland Seas until the end of May, when the ice finally started to retreat. Most of the ice retreat in May occurred within the Pacific sector, particularly within the Sea of Okhotsk, and the Bering and Chukchi Seas. 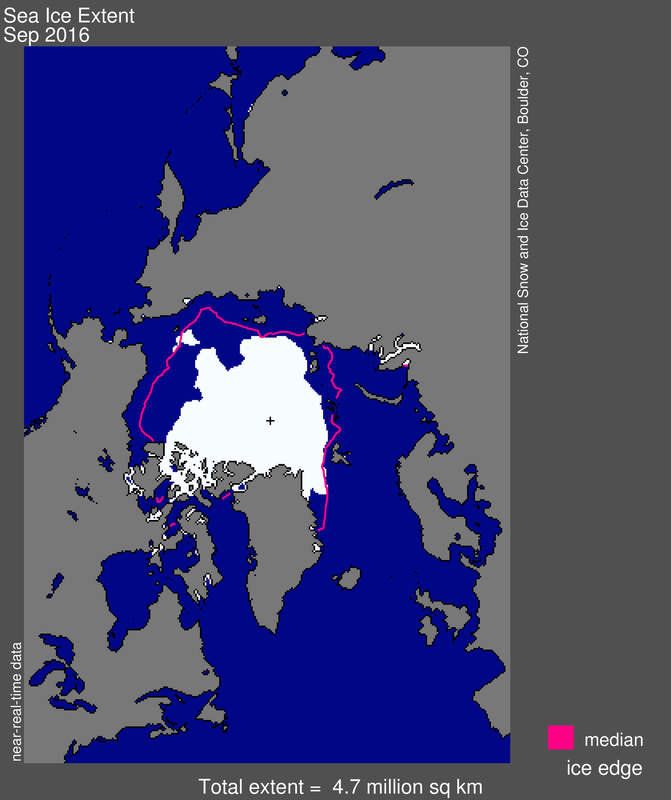 Overall, air temperatures at the 925 hPa level were 2 to 4 degrees Celsius (4 to 7 degrees Fahrenheit) below average over Eurasia and extending over the Barents, Kara and Laptev Seas, and 1 to 4 degrees Celsius (2 to 7 degrees Fahrenheit) above average over the East Siberian, Chukchi, and Beaufort Seas (Figure 2b). Figure 3. 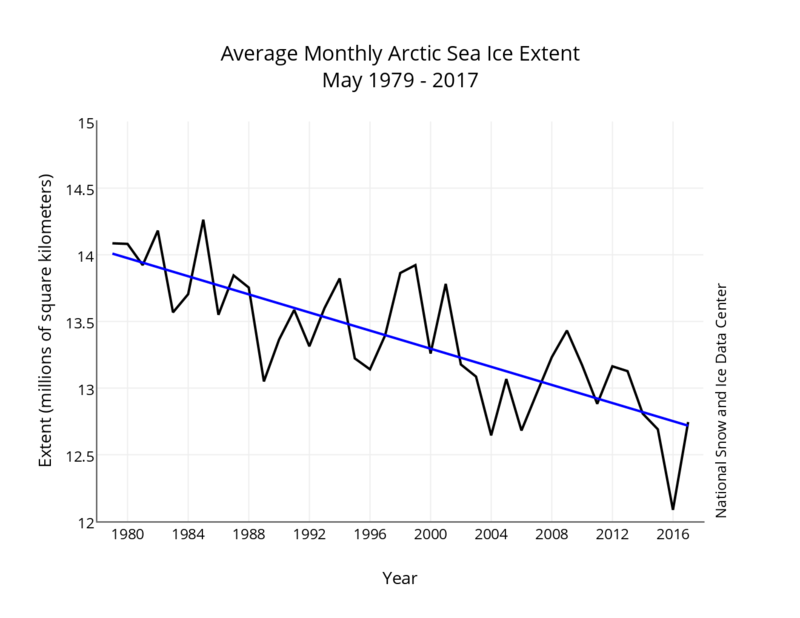 Monthly May ice extent for 1979 to 2017 shows a decline of 2.5 percent per decade. The linear rate of decline for May is 33,900 square kilometers (13,100 square miles) per year, or 2.5 percent per decade. Fig. 4a. This map shows sea ice concentration in percent coverage for the Alaska area on May 22, 2017. Figure 4b. 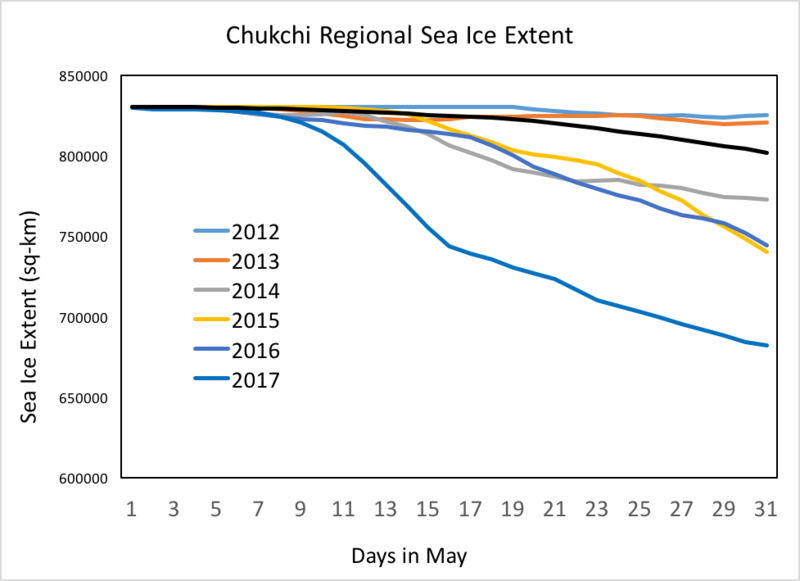 The plot shows daily May sea ice extent, in square kilometers, in the Chukchi Sea region for 2012 to 2017. Figure 4c. The graph shows cumulative temperature departures from average for each year, in degrees Fahrenheit, for Barrow, Alaska from 1921 to May 2017. 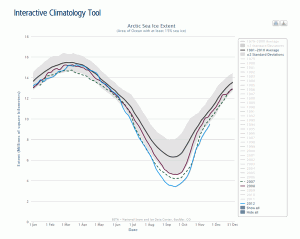 Notably, sea ice within the Chukchi Sea retreated earlier than seen at any other time in the satellite data record. By the third week in May, open water extended all the way to Barrow, Alaska (Figure 4a). 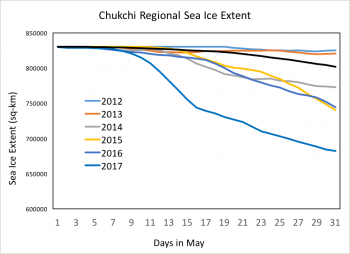 Figure 4b shows daily ice extent for May from 2012 onward in the Chuckchi Sea. The rapid retreat in 2017 stands out. A recent report by the National Oceanographic Atmospheric Administration (NOAA) indicates that the amount of open water north of 68o N at this time of year is unprecedented. Part of the explanation for earlier open water formation in the Chukchi Sea is the unusually high air temperatures in that region during the previous winter. 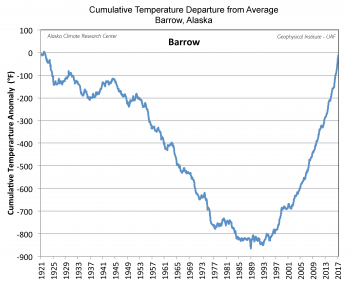 It is instructive to look at the cumulative temperature departure from average for Barrow, Alaska (Figure 4c). 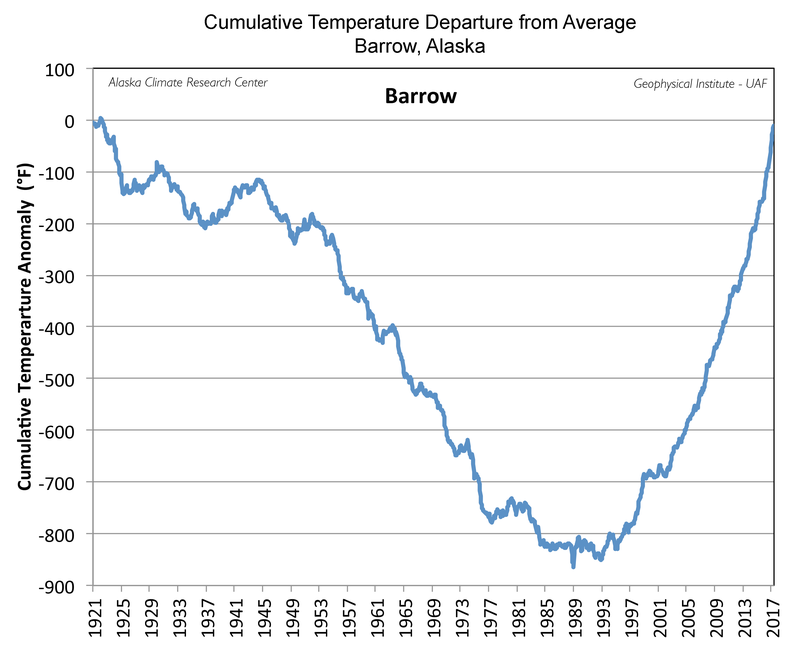 From 1921 until about 1989, conditions at Barrow actually got progressively cooler. However, since that time, temperatures have markedly increased. Consistent with warm conditions, extensive open water in the Chukchi Sea region persisted into December; the delayed ice growth potentially led to thinner ice than usual in spring. In addition, strong winds from the north occurred for a few days at the end of March and early April, pushing ice southward in the Bering Sea, breaking up the ice in the Chukchi Sea, and even flushing some ice out through the Bering Strait. At the same time further east near Barrow, winds helped to push ice away from the coast. 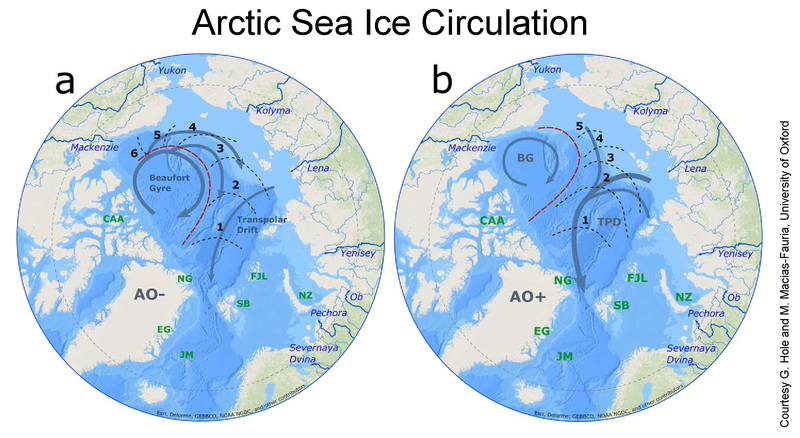 Based on recent work by NSIDC and the University of Washington, the pattern of spring sea ice retreat also suggests a role of strong oceanic heat inflow to the Chukchi Sea via Bering Strait. The ARCUS Sea Ice for Walrus Outlook (SIWO) provides weekly reports from April to June on sea ice conditions in the northern Bering Sea and southern Chukchi Sea regions of Alaska to support subsistence hunters and coastal communities. While the reports are not intended for operational planning or navigation, they provide detailed ice and weather observations for the region, some made by local community members, others from operational forecast centers. The most recent update on June 2nd discusses the continued rapid deterioration of sea ice between Wales and Shishmaref, Alaska. Nearly ice-free conditions around Nome, Alaska reflect warmer waters from the Bering Sea moving into the region. Some sea ice remains attached to the shore along the northeast coast of St. Lawrence Island, but the Bering Sea is essentially ice free. Prime walrus hunting for these communities is typically in May. However, when the ice retreats early, the walrus go with it, reducing the number of walrus the local communities can hunt. 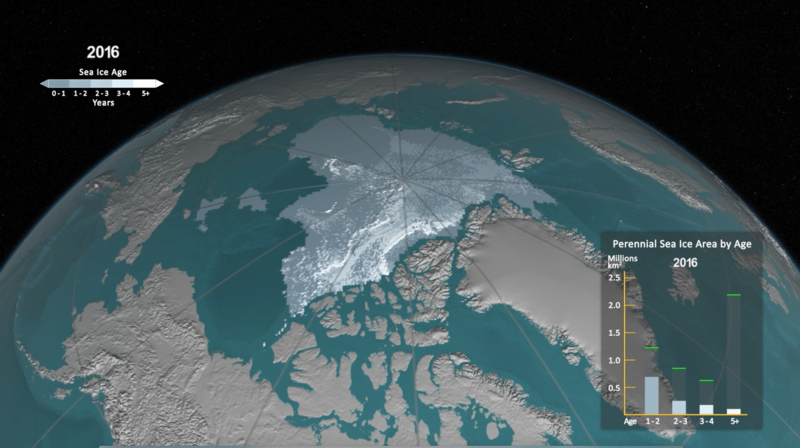 NSIDC has released a new set of tools for sea ice analysis and visualization. 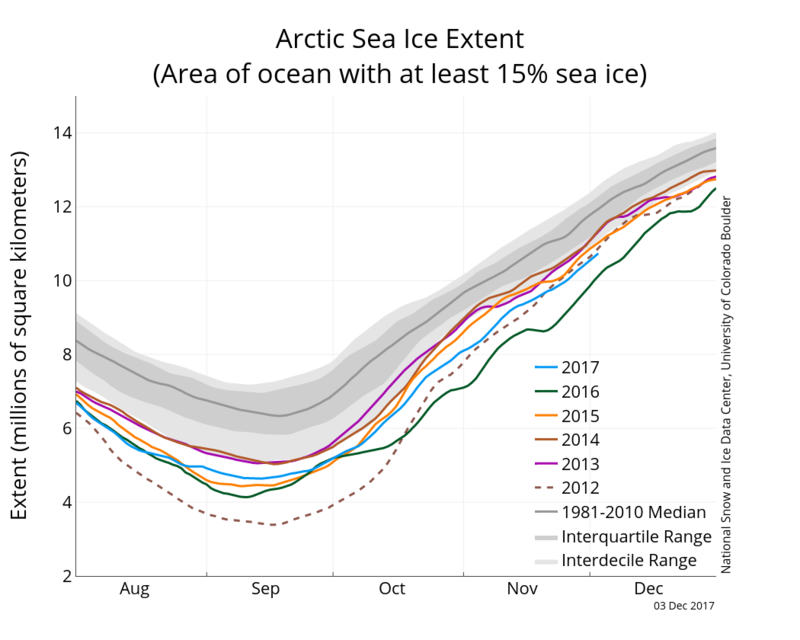 In addition to Charctic, our interactive sea ice extent graph, the new Sea Ice Data and Analysis Tools page provides access to Arctic and Antarctic sea ice data organized in seven different data workbooks, updated daily or monthly. 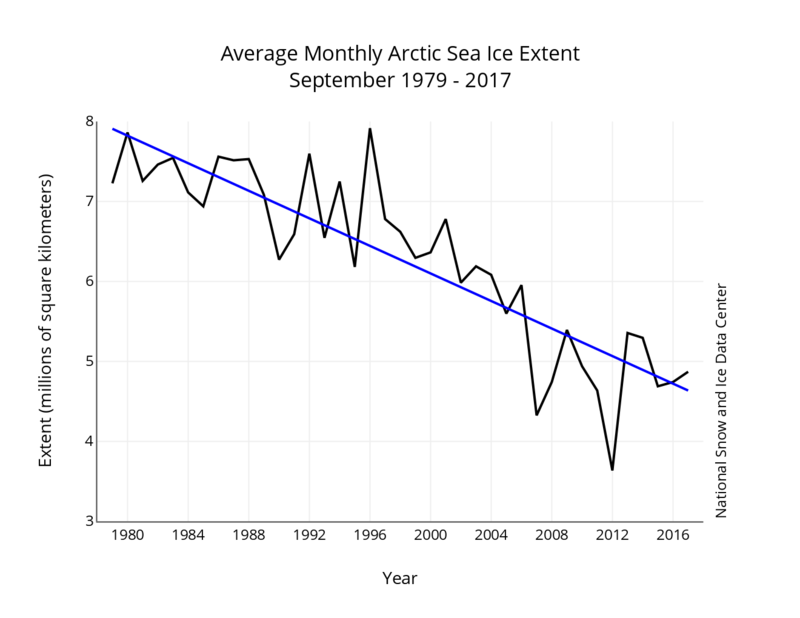 Animations of September Arctic and Antarctic month average sea ice and concentrations may also be accessed from this page. Serreze, M.C., Crawford, A., Stroeve, J. C., Barrett, A.P. and Woodgate, R.A. 2016. Variability, trends and predictability of seasonal sea ice retreat and advance in the Chukchi Sea. Journal of Geophysical Research, 121, doi:10.1002/2016JC011977. Arctic sea ice extent for March 2017 averaged 14.43 million square kilometers (5.57 million square miles), the lowest March extent in the 38-year satellite record. This is only 60,000 square kilometers (23,000 square miles) below March 2015, the previous lowest March extent, and 1.17 million square kilometers (452,000 square miles) below the March 1981 to 2010 long-term average. This month continues the record low conditions seen since October 2016. Figure 2a. 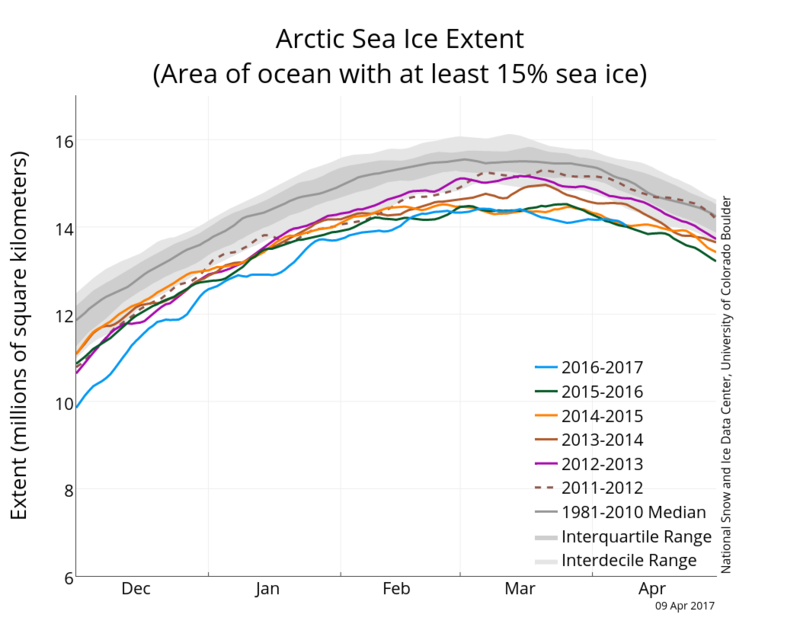 The graph above shows Arctic sea ice extent as of April 9, 2017, along with daily ice extent data for five previous years. 2017 to 2016 is shown in blue, 2015 to 2016 in green, 2014 to 2015 in orange, 2013 to 2014 in brown, 2012 to 2013 in purple, and 2011 to 2012 in dashed brown. The 1981 to 2010 median is in dark gray. The gray areas around the median line show the interquartile and interdecile ranges of the data. Sea Ice Index data. Figure 2b. The plot shows Arctic air temperature differences at the 925 hPa level (about 2,500 feet above sea level) in degrees Celsius for March 2017. Yellows and reds indicate temperatures higher than the 1981 to 2010 average; blues and purples indicate temperatures lower than the 1981 to 2010 average. Figure 2c. 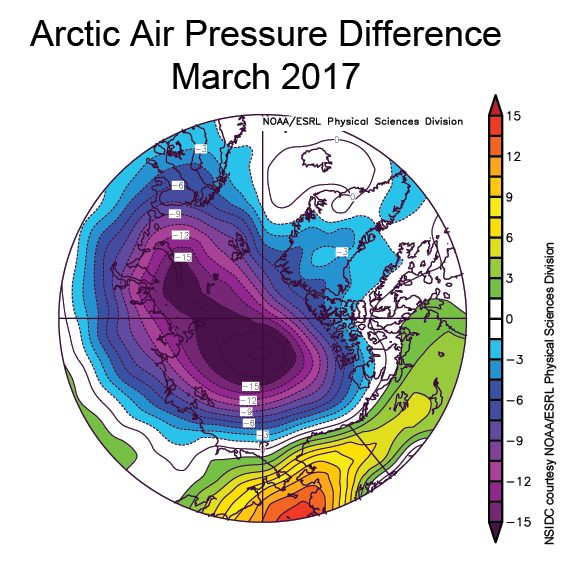 The plot shows Arctic sea level pressure (in millibars) for March 2017 expressed as departures from average conditions. The dominant feature is a large area of below average pressure covering most of the Arctic Ocean. The decline in sea ice extent following the March 2017 seasonal maximum was interrupted by a brief period of expansion from about March 11 to 15, a decline extending through about March 26, then another period of growth through the end of the month into early April. On April 4th, the extent was greater than on the same day in 2016. This type of behavior is not unusual for this time of year when declines in extent in warmer, lower latitudes can be countered by periods of expansion in the still-cold higher latitudes. Shifts in wind patterns also lead to variability. Regions that experienced slight ice advance were at the end of the month in the Barents Sea and in the Bering Sea. Nevertheless, by early April, extent remained below average in the Barents Sea and in the Sea of Okhotsk and the western Bering Sea. Interestingly, ice extended further south than usual in the eastern Bering Sea. 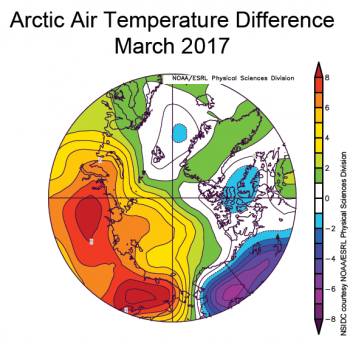 March saw continued warmth over the Arctic Ocean. The warmest conditions for March 2017 as compared to average were over Siberia. While temperatures were still well above average along the Russian coastal seas (6 to 7 degrees Celsius, or 11 to 13 degrees Fahrenheit), those over the northern North Atlantic and the Canadian Arctic Archipelago were near average. 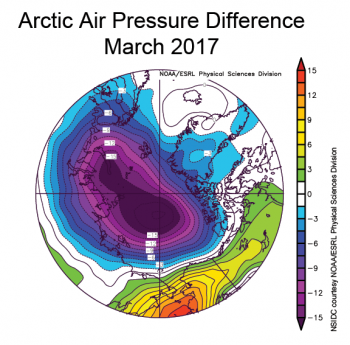 The dominant feature of the sea level pressure field for March 2017 was an area of below average pressure covering most of the Arctic Ocean. Locally, pressures were more than 15 millibars below the 1981 to 2010 average. This pattern points to a continuation of the stormy conditions that prevailed over the past winter and is broadly consistent with the positive phase of the Arctic Oscillation, a large-scale mode of climate variability. 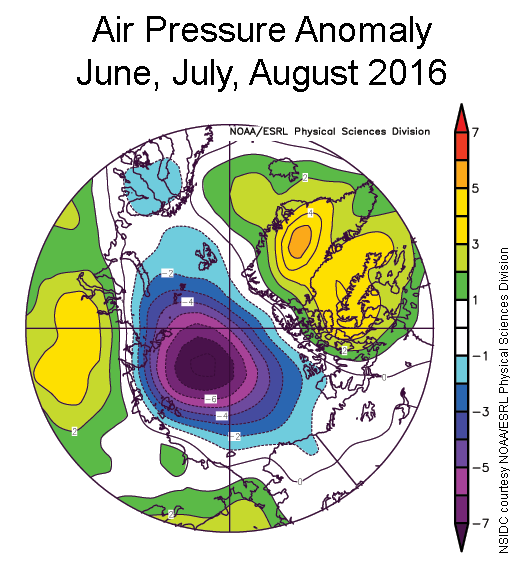 When the Arctic Oscillation is in its positive phase, sea level pressure is below average over the Arctic Ocean. The Arctic Oscillation has generally been in a positive phase since December. The unusually high Siberian temperatures for March 2017 are consistent with persistent winds from the south and east along the southern side of the low pressure. Figure 3. Monthly March ice extent for 1979 to 2017 shows a decline of 2.74 percent per decade. The linear rate of decline for March is 42,700 square kilometers (16,500 square miles) per year, or 2.74 percent per decade. Figure 4. The team prepares to measure snow thickness over sea ice in Cambridge Bay, Canada on April 5, 2017, during an AltiKa field validation campaign. NSIDC researcher Andrew Barrett is in a red jacket; Julienne Stroeve holds a magna probe. 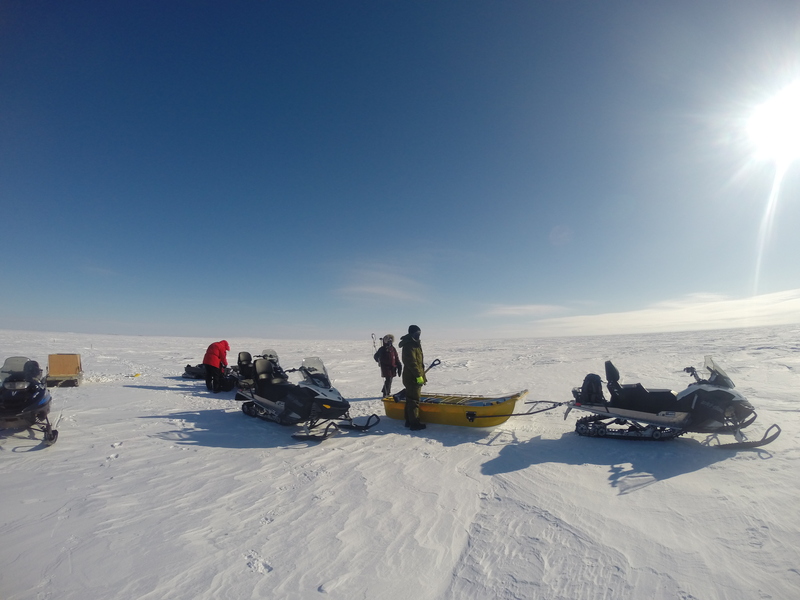 As of the publication of this post, NSIDC scientists Julienne Stroeve and Andrew Barrett are in Cambridge Bay, Canada on a satellite validation campaign. Efforts focus on ground measurements of snow depth over sea ice, ice thickness, and snow structure in order to validate the joint French/Indian AltiKa Ka band radar altimeter. Coincident aircraft Ka band and LiDAR measurements allow researchers to connect measurements on the ground with those made by the satellite. Air temperatures have ranged from -20 to -5 degrees Celsius (-4 to 23 degrees Fahrenheit), with wind chills from -40 to -20 degrees Celsius (-40 to -4 degrees Fahrenheit). Dr. Stroeve will then join another field campaign operating out of Alert, Canada for further validation of AltiKa and CryoSat2 over the Lincoln Sea. Figure 5. 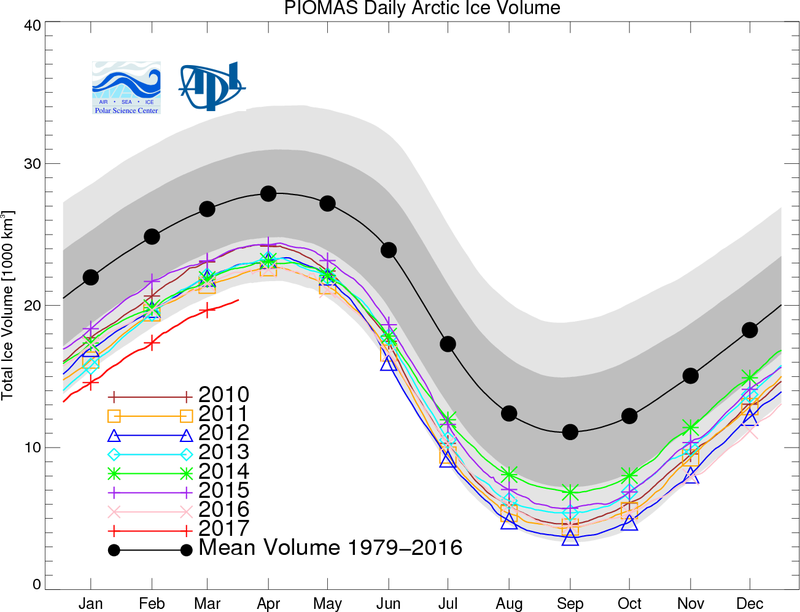 The graph shows sea ice volume from the PIOMAS model/observations for each year from 2010 through March 2017, and the 1979 to 2016 average (black line) and one (dark gray) and two (light gray) standard deviation ranges. 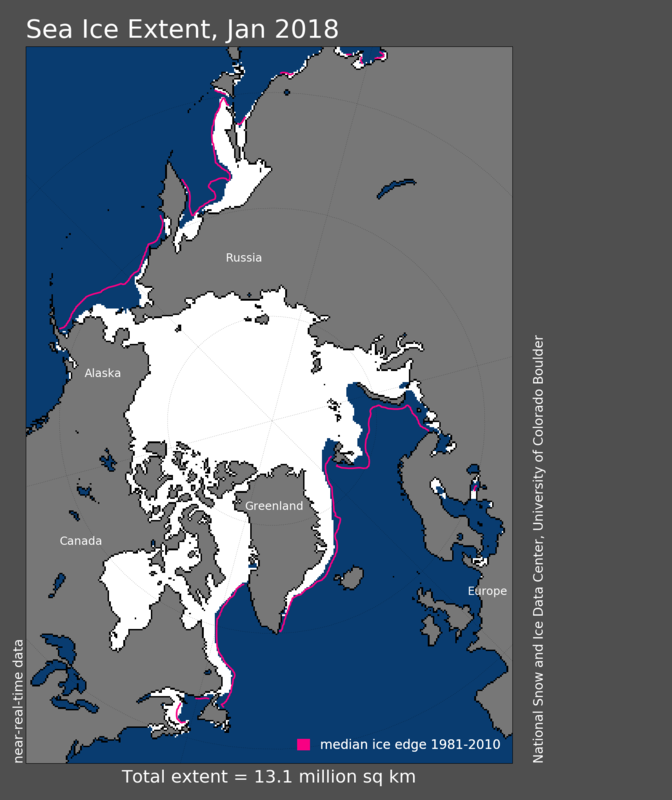 A key early indicator for the upcoming melt season is the thickness of the sea ice. An assessment of available information suggests a fairly thin ice cover, not surprising given the warm temperatures over much of the Arctic Ocean during the winter. Satellite data from the European Space Agency (ESA) CryoSat-2 radar altimeter, which is processed into sea ice thickness estimates at the University College London’s Center for Polar Observing and Modeling (CPOM) indicates ice along much of the Siberian coast with thicknesses of 1.5 to 2.0 meters (4.9 to 6.6 feet) or less. This is not atypical for seasonal ice; however this band of <2.0 meters of ice covers a much larger region and extends much farther north than it used to—well north of 80 degrees N latitude on the Atlantic side of the Arctic. 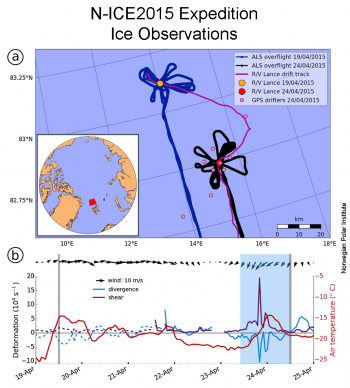 NASA’s Operation IceBridge has also been collecting data over the past month. That data will not be available for a few weeks; a key focus of some flights has involved collaboration with ESA to collect coincident data with CryoSat-2 to help validate the satellite estimates. 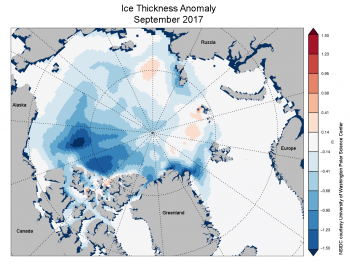 Another way to estimate thickness and total ice volume is with a combination of observations and a model, which is done by the University of Washington Polar Science Center’s University of Washington Polar Science Center’s Pan-Arctic Ice Ocean Modeling and Assimilation System (PIOMAS). 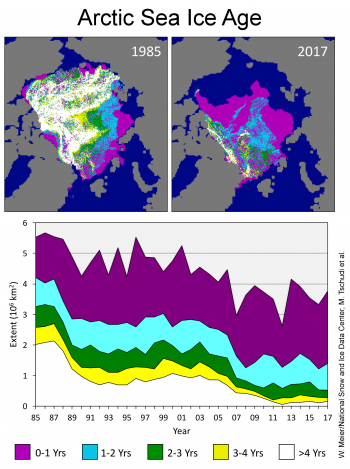 The model uses observed sea ice concentration fields to constrain the model and estimates thickness and total volume via physical simulations in the model. 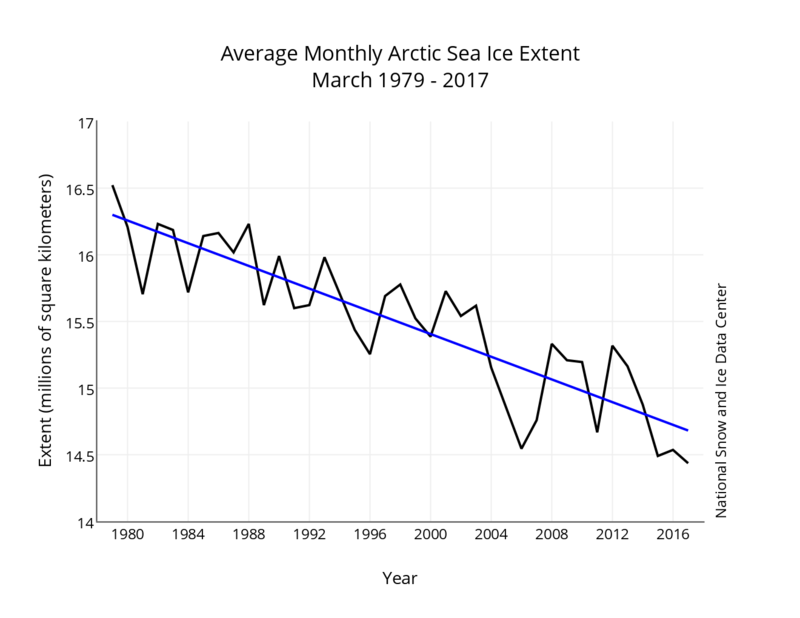 It shows that sea ice volume has been at record low levels throughout 2017 so far (Figure 5). For many years, scientists have pondered how much of the sharp decline in summer sea ice extent and volume is due to “top down” forcing—a warmer atmosphere leading to more summer melt and less winter growth, versus “bottom up” forcing, in which ocean heat is brought to bear on the underside of the ice. There is a great deal of heat in the Arctic Ocean from waters that are imported from the Atlantic. As fairly warm and salty Atlantic water enters the Arctic Ocean it dives underneath the relatively fresh Arctic Ocean surface layer. Because the fresh surface layer has a fairly low density, the vertical structure of the Arctic Ocean is very stable. As such, it is hard to mix this Atlantic heat upwards to melt ice or keep it from forming in the first place. However, new work by an international team led by Igor Polyakov of the University of Alaska Fairbanks provides strong evidence that Atlantic layer heat is now playing a prominent role in reducing winter ice formation in the Eurasian Basin, which is manifested as more summer ice loss. 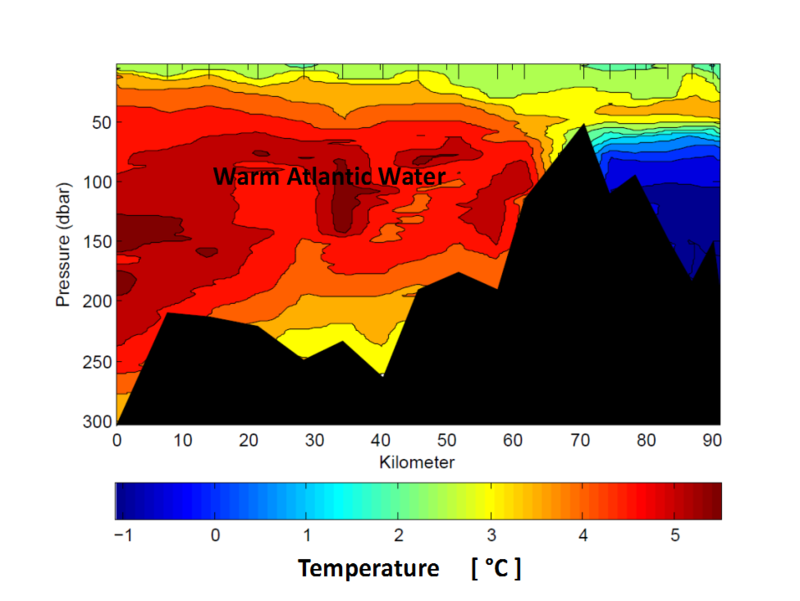 According to their analysis, the ice loss due to the influence of Atlantic layer heat is comparable in magnitude to the top down forcing by the atmosphere. Figure 6. 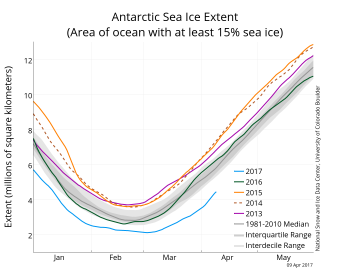 The graph above shows Antarctic sea ice extent as of April 9, 2017, along with daily ice extent data for four previous years. 2017 is shown in blue, 2016 in green, 2015 in orange, 2014 in brown, and 2013 in purple. The 1981 to 2010 median is in dark gray. The gray areas around the median line show the interquartile and interdecile ranges of the data. Sea Ice Index data. 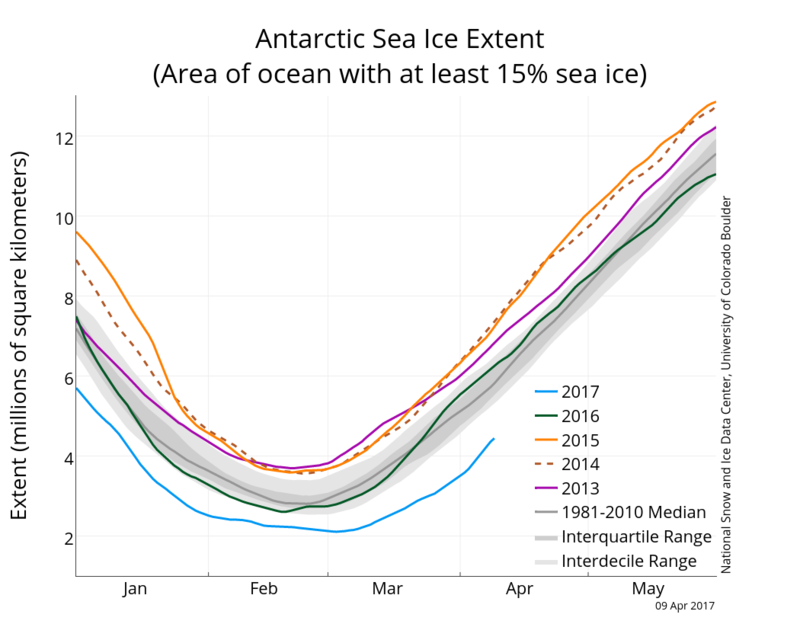 Following the record-low seasonal sea ice minimum, Antarctic sea ice extent has sharply risen, but extent is still far below average, and set daily record low values throughout the month of March. 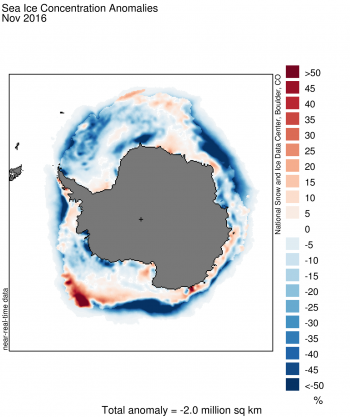 Regionally, sea ice recovered to near average conditions in the Weddell Sea and around much of the coast of East Antarctica. The primary region of below average extent was in the Ross, Amundsen, and Bellingshausen Sea regions, as has been the case throughout the spring and summer. This appears to be related to warmer-than-average sea surface temperatures. Polyakov, I., A.V. Pnyushkov, M.B. Alkire, I.M. Ashik, T.M. Baumann, E.C. Carmack and 10 others. 2017. 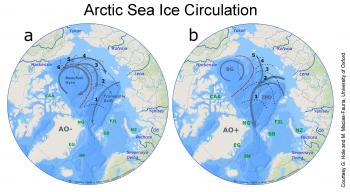 Greater role for Atlantic inflows on sea-ice loss in the Eurasian Basin of the Arctic Ocean. Science, doi:10.1126/science.aai8204. 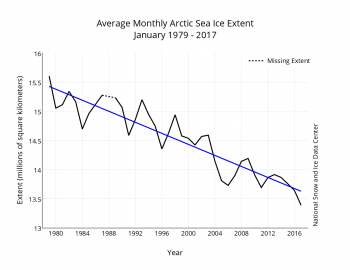 Record low daily Arctic ice extents continued through most of January 2017, a pattern that started last October. 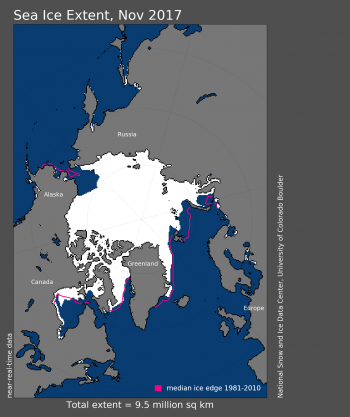 Extent during late January remained low in the Kara, Barents and Bering Seas. Southern Hemisphere extent also tracked at record low levels for January; globally, sea ice cover remains at record low levels. Arctic sea ice extent for January 2017 averaged 13.38 million square kilometers (5.17 million square miles), the lowest January extent in the 38-year satellite record. This is 260,000 square kilometers (100,000 square miles) below January 2016, the previous lowest January extent, and 1.26 million square kilometers (487,000 square miles) below the January 1981 to 2010 long-term average. 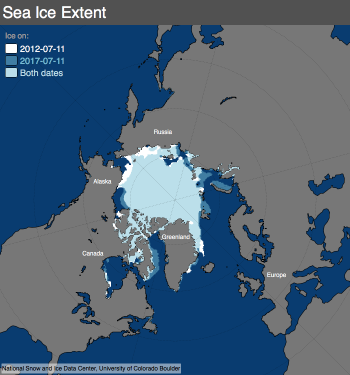 Ice growth stalled during the second week of the month, and the ice edge retreated within the Kara and Barents Seas, and within the Sea of Okhotsk. After January 16, extent increased at a more rapid pace, but the rate of ice growth was still below average for January as a whole. For a few days towards the end of the month, the extent was slightly greater than recorded in 2006, a year which also saw many record low days in January, but by the 30th it was tracking below 2006. Through most of January the ice edge remained north of the Svalbard Archipelago, largely due to the inflow of warm Atlantic water along the western part of the archipelago. However, by the end of January, some ice was found to the northeast and northwest of Svalbard. At the end of January, ice extent remained well below average within the Kara, Barents, and Bering Seas. Figure 2a. 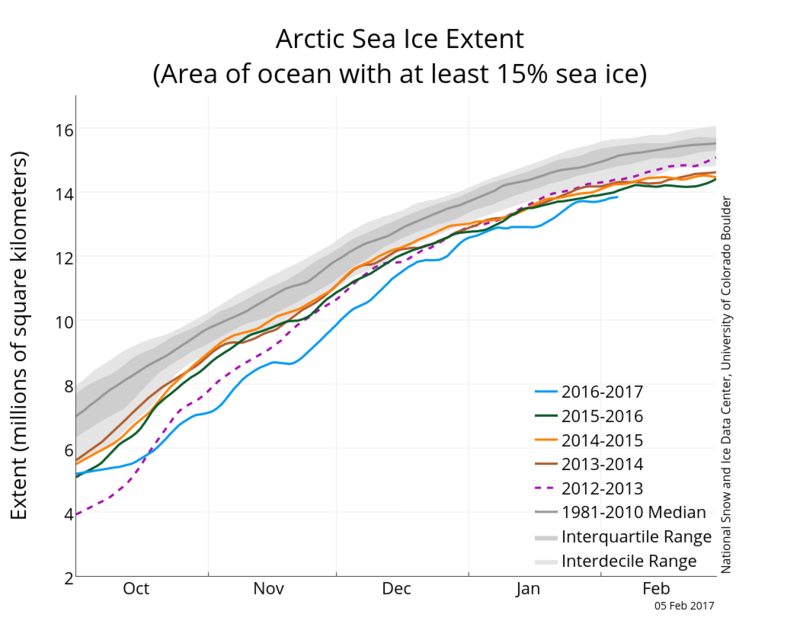 The graph above shows Arctic sea ice extent as of February 5, 2017, along with daily ice extent data for four previous years. 2016 to 2017 is shown in blue, 2015 to 2016 in green, 2014 to 2015 in orange, 2013 to 2014 in brown, and 2012 to 2013 in purple. The 1981 to 2010 average is in dark gray. The gray areas around the median line show the interquartile and interdecile ranges of the data. Sea Ice Index data. Figure 2b. 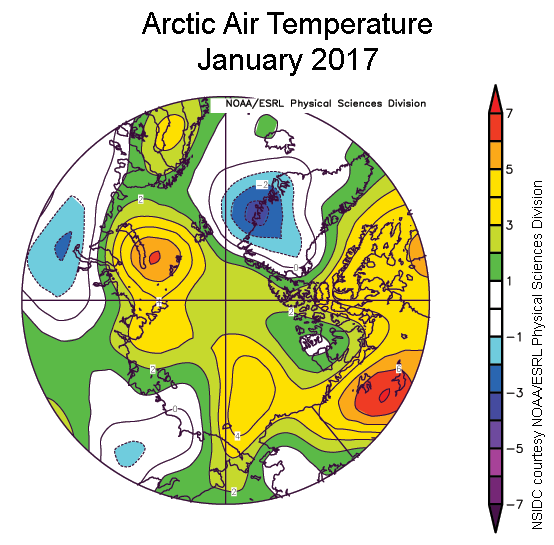 The plot shows Arctic air temperature difference from average, in degrees Celsius, for January 2017. 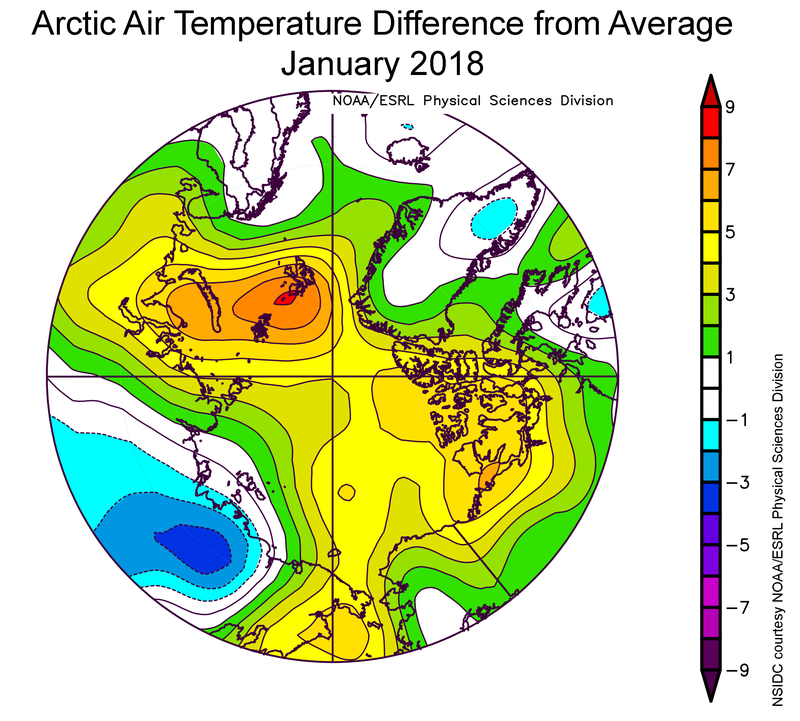 January air temperatures at the 925 hPa level (approximately 2,500 feet above sea level) were above average over nearly all of the Arctic Ocean, continuing the pattern that started last autumn (Figure 2b). Air temperatures were more than 5 degrees Celsius (9 degrees Fahrenheit) above the 1981 to 2010 average over the northern Barents Sea and as much as 4 degrees Celsius (7 degrees Fahrenheit) above average in the northern Chukchi and East Siberian Seas. It was also unusually warm over northwestern Canada. Cooler than average conditions (up to 3 degrees Celsius, or 5 degrees Fahrenheit below average) prevailed over the northwest part of Russia and the northeast coast of Greenland. Atmospheric circulation over the Arctic during the first three weeks of January was characterized by a broad area of below average sea level pressure extending over almost the entire Arctic Ocean. 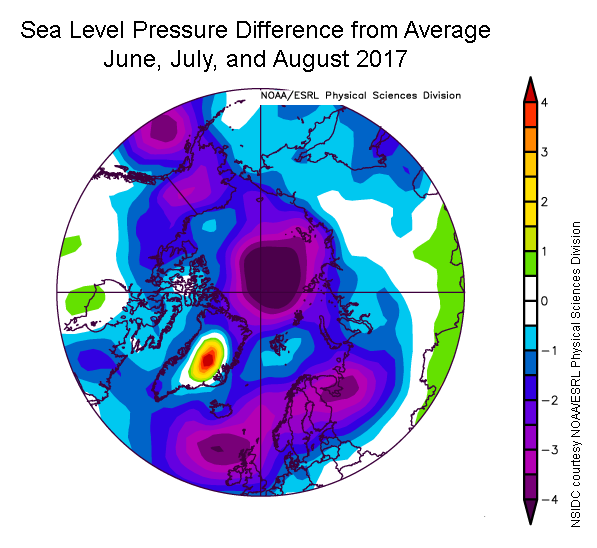 Higher-than-average sea level pressure dominated over the Gulf of Alaska and the North Atlantic Ocean south of Iceland. This set up warm southerly winds from both the northern North Atlantic and the Bering Strait areas, helping to explain the high January air temperatures over the Arctic Ocean. According to the analysis of NASA scientist Richard Cullather, the winter of 2015 to 2016 was the warmest ever recorded in the Arctic in the satellite data record. Whether the winter of 2016 to 2017 will end up warmer remains to be seen; conditions are typically highly variable. For example, during the last week of January, the area of low pressure shifted towards the Siberian side of the Arctic. In the northern Laptev Sea, pressures fell to more than 20 hPa below the 1981 to 2010 average. This was associated with a shift towards cooler conditions over the Arctic Ocean, which may explain why ice extent towards the end of the month rose above levels recorded in 2006. Figure 3. 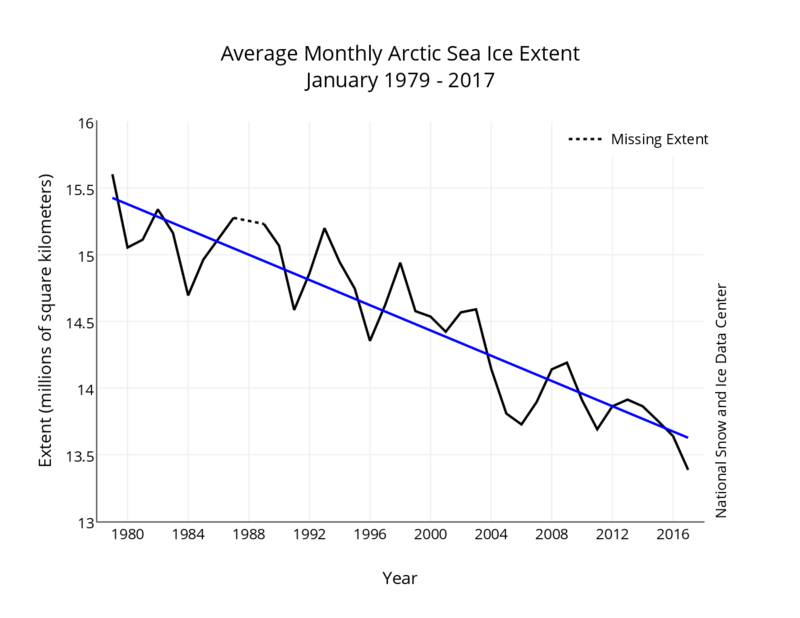 Monthly January ice extent for 1979 to 2017 shows a decline of 3.2 percent per decade. Through 2017, the linear rate of decline for January is 47,400 square kilometers (18,300 square miles) per year, or 3.2 percent per decade. Extent is tracking at records low levels in the Southern Hemisphere, where it is currently summer. As shown in this plot for February 5, this is primarily due to low ice extent within the Amundsen Sea, where only a few scattered patches of ice remain. 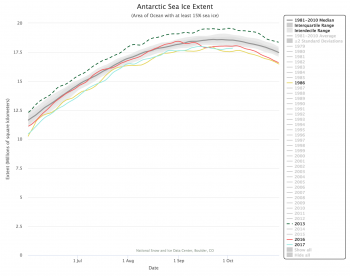 By contrast, extent in the Weddell Sea is now only slightly below average. This pattern is consistent with persistent above average air temperatures off western Antarctica. Cullather, R. I., Y.-K. Lim, L. N. Boisvert, L. Brucker, J. N. Lee, and S. M. J. Nowicki. 2016. Analysis of the warmest Arctic winter, 2015-2016. Geophysical Research Letters,43, doi:10.1002/2016GL071228. In November 2016, Arctic sea ice extent averaged 9.08 million square kilometers (3.51 million square miles), the lowest November in the satellite record. This is 800,000 square kilometers (309,000 square miles) below November 2006, the previous lowest November, and 1.95 million square kilometers (753,000 square miles) below the 1981 to 2010 long-term average for November. For the month, ice extent was 3.2 standard deviations below the long-term average, a larger departure than observed in September 2012 when the Arctic summer minimum extent hit a record low. At this time of year, air temperatures near the surface of the Arctic Ocean are generally well below freezing, but this year has seen exceptional warmth. The overall rate of ice growth this November was 88,000 square kilometers (34,000 square miles) per day, a bit faster than the long-term average of 69,600 square kilometers (26,900 square miles) per day. However, for a brief period in the middle the month, total extent actually decreased by 50,000 square kilometers, or 19,300 square miles—an almost unprecedented occurrence for November over the period of satellite observations. A less pronounced and brief retreat of 14,000 square kilometers (5,400 square miles) occurred in 2013. Ice growth during November as a whole occurred primarily within the Beaufort, Chukchi and East Siberian Seas, as well as within Baffin Bay. Ice extent slightly retreated in the Barents Sea for the month. Compared to the previous record low for the month set in 2006, sea ice was less extensive in the Kara, Barents, East Greenland, and Chukchi Seas, and more extensive in Baffin Bay this year. Figure 2a. The graph above shows daily Arctic sea ice extent as of December 5, 2016, along with daily ice extent data for four previous years. 2016 is shown in blue, 2015 in green, 2014 in orange, 2013 in brown, and 2012 in purple. The 1981 to 2010 average is in dark gray. The gray area around the average line shows the two standard deviation range of the data. Sea Ice Index data. Figure 2b. 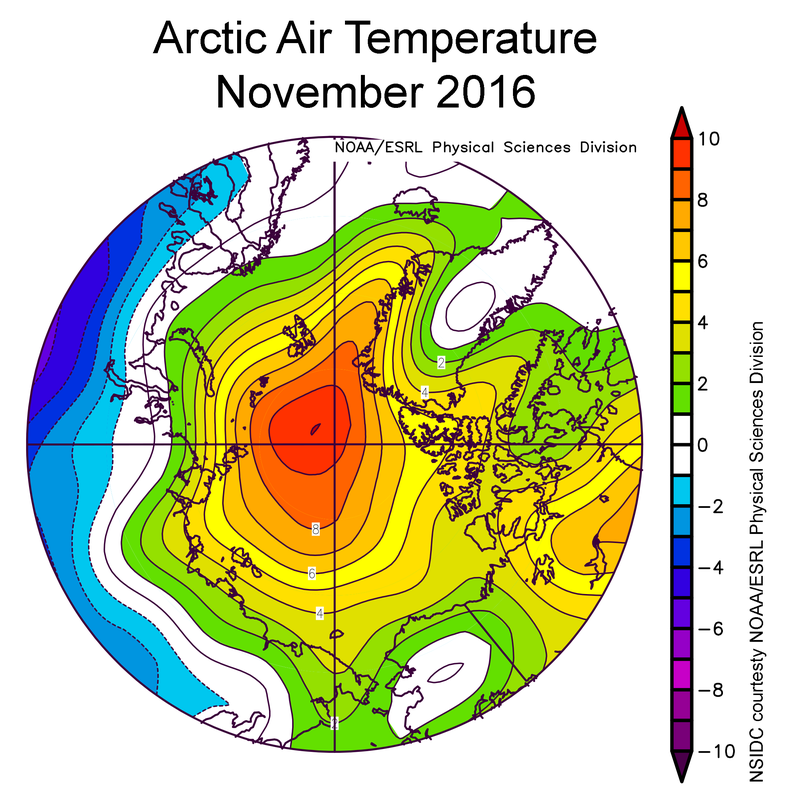 This plot shows air temperature difference from average in the Arctic for November 2016. Air temperatures at the 925 hPa (approximately 2,500 feet) level in the atmosphere were above the 1981 to 2010 average over the entire Arctic Ocean and, locally up to 10 degrees Celsius (18 degrees Fahrenheit) above average near the North Pole. This is in sharp contrast to northern Eurasia, where temperatures were up to 4 to 8 degrees Celsius (7 to 14 degrees Fahrenheit) below average. Continuing the warm Arctic pattern seen in October, November air temperatures were far above average over the Arctic Ocean and Canada. Air temperatures at the 925 hPa level (about 2,500 feet above sea level) were above the 1981 to 2010 average over the entire Arctic Ocean and, locally up to 10 degrees Celsius (18 degrees Fahrenheit) above average near the North Pole. This is in sharp contrast to northern Eurasia, where temperatures were as much as 4 to 8 degrees Celsius (7 to 14 degrees Fahrenheit) below average (Figure 2b). Record snow events were reported in Sweden and across Siberia early in the month. In autumn and winter, the typical cyclone path is from Iceland, across the Norwegian Sea and into the Barents Sea. This November, an unusual jet stream pattern set up, and storms instead tended to enter the Arctic Ocean through Fram Strait (between Svalbard and Greenland). This set up a pattern of southerly wind in Fram Strait, the Eurasian Arctic and the Barents Sea and accounts for some of the unusual warmth over the Arctic Ocean. The wind pattern also helped push the ice northwards and helps to explain why sea ice in the Barents Sea retreated during November. Sea surface temperatures in the Barents and Kara Seas remained unusually high, which also helped prevent ice formation. These high sea surface temperatures are a result of warm Atlantic water circulating onto the Arctic continental shelf seas. Figure 3. 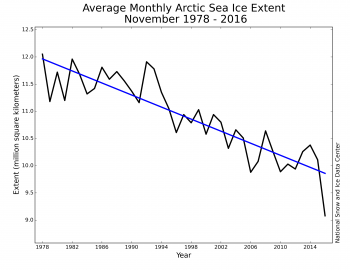 Monthly November ice extent for 1979 to 2016 shows a decline of 5.0 percent per decade. Through 2016, the linear rate of decline for November is 55,400 square kilometers (21,400 square miles) per year, or 5.0 percent per decade. Figure 4a. This plot shows ocean temperature by depth (y axis, in decibars; a decibar is approximately one meter) along a transect (x axis, in kilometers) from the outer continental shelf to the inner parts of Isfjorden, the largest fjord in the Svalbard archipelago, for mid November 2016. (Areas in black show the undersea topography.) 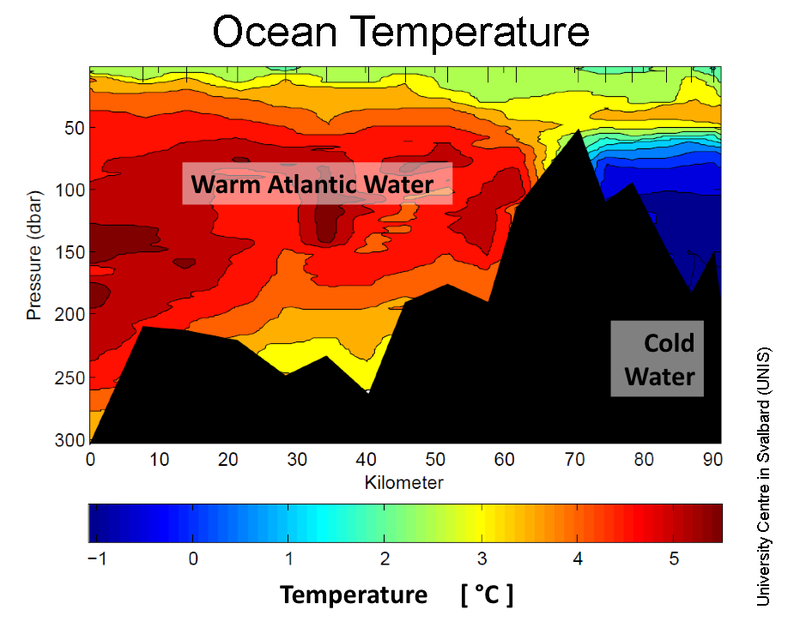 Atlantic Water is as warm as 5 degrees Celsius (41 degrees Fahrenheit) and the surface layer still about 2 degrees Celsius (36 degrees Fahrenheit). The surface layer would normally have cooled to the salinity adjusted freezing point at (-1.8 degrees Celsius, 29 degrees Fahrenheit) at this time of year, enabling sea ice formation. Figure 4b. The West Spitsbergen Current consists of three branches (red arrows) that transport warm and salty Atlantic Water northward: the Return Atlantic Current (westernmost branch), the Yermak Branch and the Svalbard Branch. The Spitsbergen Trough Current (purple) transports Atlantic Water from the Svalbard Branch into the troughs indenting the shelf along Svalbard. Since 2006, changes in atmospheric circulation have resulted in more warm Atlantic Water reaching these fjords. The blue and red circles on the figure indicate locations where hydrographic data were collected. Figure 4c. An inky-black polar night—but no cooling. 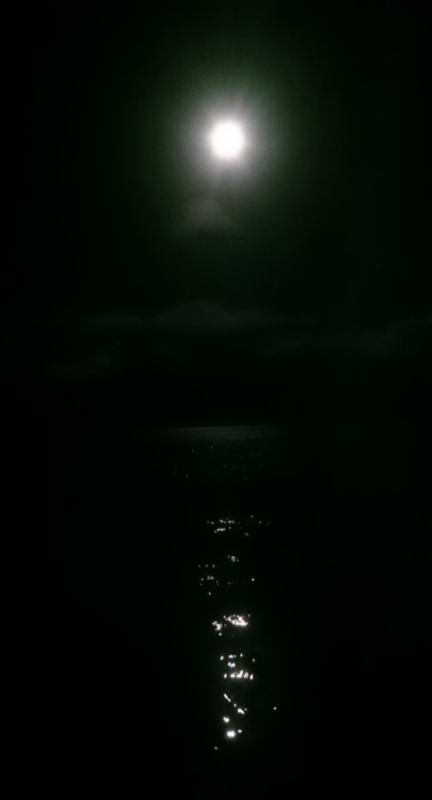 The moon is the only source of light in the Arctic now, and here shines over open water in Isfjorden, the largest fjord in the Svalbard archipelago, in mid-November 2016. In the Svalbard archipelago, sea ice usually begins to form in the inner parts of the fjords in early November. This November, however, no sea ice was observed. Throughout autumn, the wind pattern transported warm and moist air to Svalbard, leading to exceptionally high air temperatures and precipitation, which fell as rain. Atmospheric and oceanic conditions in the fjord system were assessed by students from the University Centre in Svalbard. They noted an unusually warm ocean surface layer about 4 degrees Celsius (7 degrees Fahrenheit) above the salinity-adjusted freezing point (Figure 4a). Coinciding with exceptionally high air temperatures over Svalbard during autumn, the water has hardly cooled at all, and it is possible that no sea ice will form this winter. The above average ocean temperatures arose in part from changes in ocean currents that bring warm and salty Atlantic Water into the fjords. 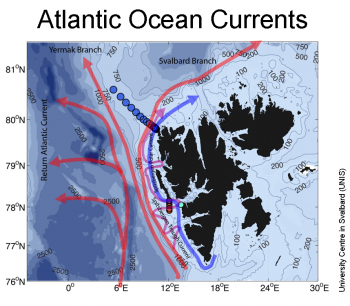 As the warm Gulf Stream moves east, it becomes the branching North Atlantic Drift. One small branch is named the West Spitsbergen Current (Figure 4b). This current flows along the continental shelf on the west coast of Svalbard and is one mechanism for transporting heat towards the fjords. Since 2006, changes in atmospheric circulation have resulted in more Atlantic water reaching these fjords, reducing sea ice production in some and stopping ice formation entirely in others. Figure 5a. 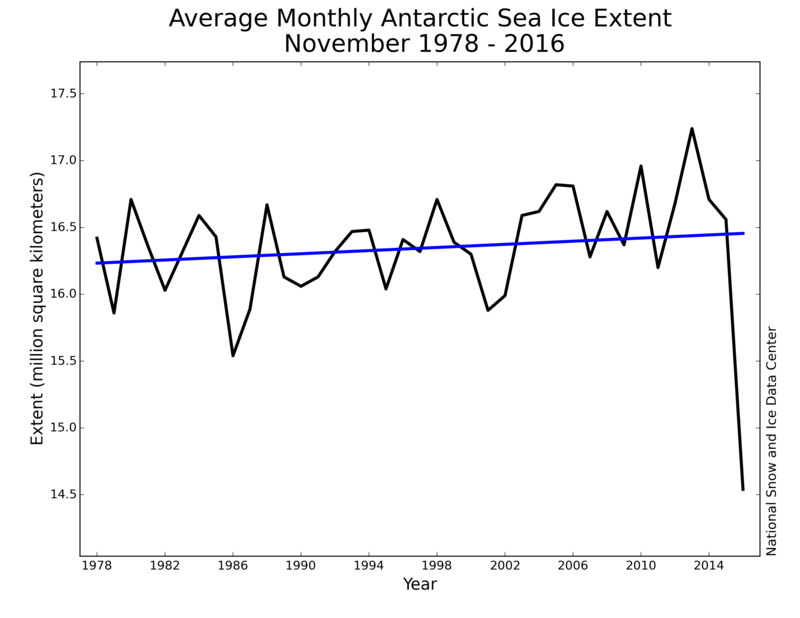 Monthly November Antarctic sea ice extent for 1979 to 2016 shows an increase of 0.36 percent per decade. Figure 5b. 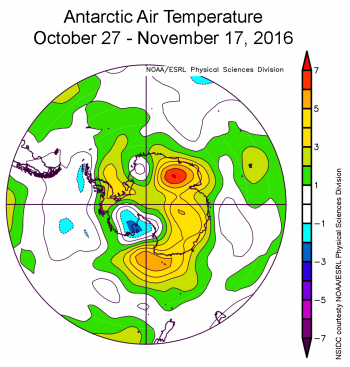 This plot shows air temperature difference from average in the Antarctic for October 27 to November 17, 2016. 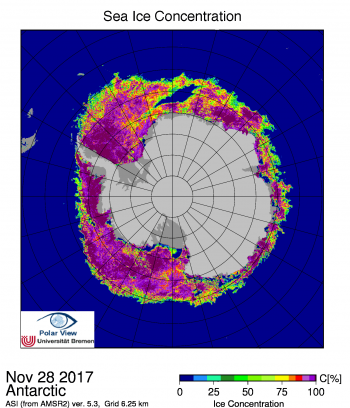 Air temperatures at the 925 hPa level (approximately 2,500 feet) during the period of rapid sea ice decline in Antarctica (October 27 through November 17) were 2 to 4 degrees Celsius (4 to 7 degrees Fahrenheit) above average near the sea ice edge. Figure 5c. This map of sea ice concentration difference from average for November 2016 shows very low ice extent in three areas of the ice edge (near the Antarctic Peninsula, near the western Ross Sea and Wilkes Land, and near Enderby Land) as well as extensive areas of lower-than-average concentration within the interior ice pack in the Weddell Sea, Amundsen Sea, and near the Amery Ice Shelf. Sea Ice Index data. 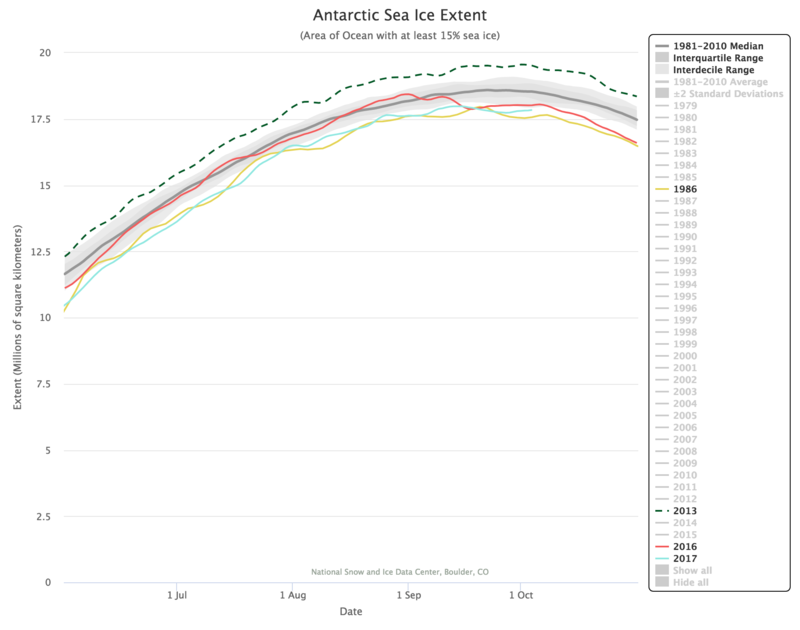 This year, Antarctic sea ice reached its annual maximum extent on August 31, much earlier than average, and has since been declining at a fairly rapid pace, tracking more than two standard deviations below the 1981 to 2010 average. This led to a new record low for the month of November over the period of satellite observations (Figure 5a). Average extent in November was 14.54 million square kilometers (5.61 million square miles). This was 1.0 million square kilometers (386,000 square miles) below the previous record low of 15.54 million square kilometers (6.00 million square miles) set in 1986 and 1.81 million square kilometers (699,000 square miles) below the 1981 to 2010 average. 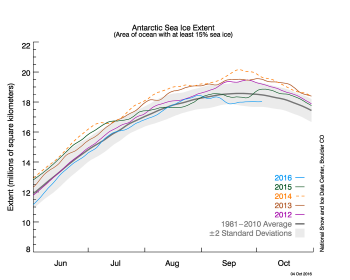 For the month, Antarctic ice extent was 5.7 standard deviations below the long-term average. This departure from average was more than twice as large as the previous record departure from average, set in November 1986. Ice extent is lower than average on both sides of the continent, particularly within the Indian Ocean and the western Ross Sea, but also to a lesser extent in the Weddell Sea and west of the Antarctic Peninsula in the eastern Bellingshausen Sea. Moreover, several very large polynyas (areas of open water within the pack) have opened in the eastern Weddell and along the Amundsen Sea and Ross Sea coast. Air temperatures at the 925 mbar level were 2 to 4 degrees Celsius (4 to 7 degrees Fahrenheit) above average near the sea ice edge during late October and early November, corresponding to the period of rapid sea ice decline (Figure 5b). The entire austral autumn and winter (since March 2016) was characterized by generally strong west to east winds blowing around the continent. This was associated with a positive phase of the Southern Annular Mode, or SAM. This pattern tends to push the ice eastward, but the Coriolis force acting in the ice adds a component of northward drift. During austral spring (September, October and November), the SAM index switched from strongly positive (+4 in mid-September, a record) to negative (-2.8 in mid-November). When the westerly wind pattern broke down in November, winds in several areas of Antarctica started to blow from the north. Over a broad area near Wilkes Land, the ice edge was pushed toward the continent. Areas with southward winds were also located between Dronning Maud Land and Enderby Land, and near the Antarctic Peninsula. 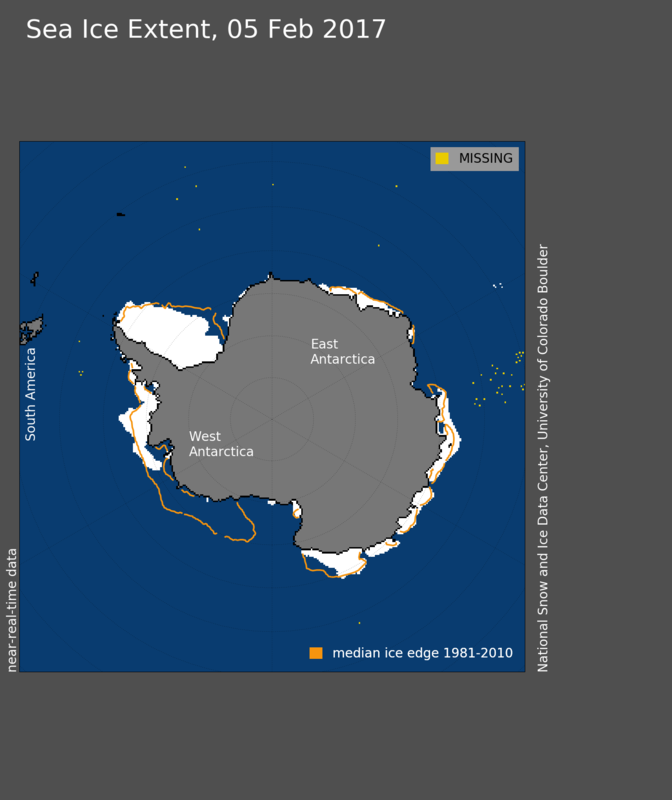 This created three regions where ice extent quickly became much less extensive than usual (Figure 5c), reflected in the rapid decline in extent for the Antarctic as a whole. Interspersed with the areas of compressed sea ice and winds from the north, areas of south winds produced large open water areas near the coast, creating the polynyas. Figure 6. This plot shows the relationship between September sea ice extent (1953 to 2015) and cumulative CO2 emissions since 1850. Grey diamonds represent the individual satellite data values; circles represent pre-satellite era values; the solid red line shows the 30-year running average. The dotted red line indicates the linear relationship of 3 square meters per metric ton of CO2. 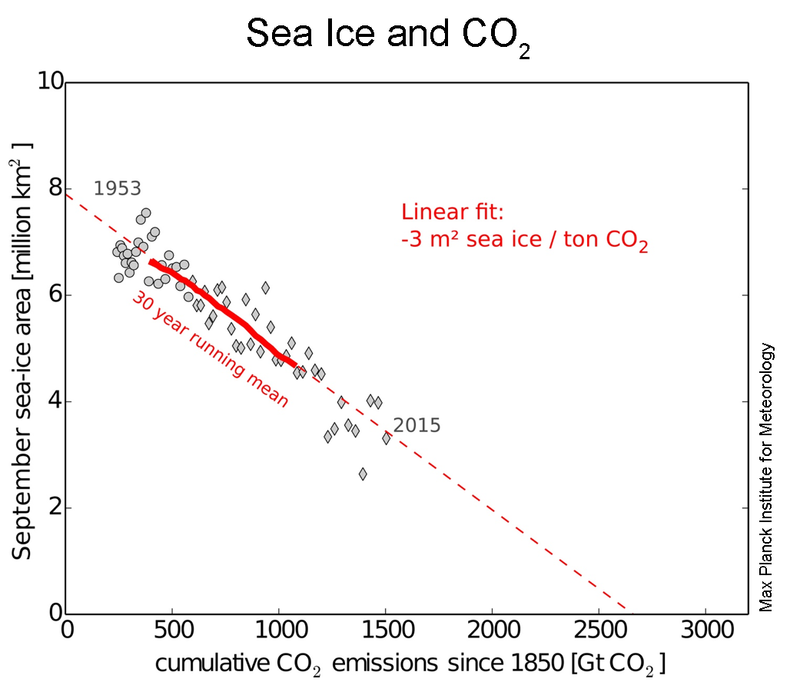 A new study published in the journal Science links Arctic sea ice loss to cumulative CO2 emissions in the atmosphere through a simple linear relationship (Figure 6). Researchers conducting the study, including NSIDC scientist Julienne Stroeve, examined this linear relationship based on observations from the satellite and pre-satellite era since 1953, and in climate models. The observed relationship is equivalent to a loss of 3 square meters (32 square feet) for every metric ton of CO2 added to the atmosphere, compared the average from all the climate models of 1.75 square meters (19 square feet). This smaller value, or lower sensitivity, from the models is consistent with findings that the models tend to be generally conservative relative to observations in regard to how fast the Arctic has been losing its summer ice cover. The observed rate of ice loss per metric ton of CO2 allows individuals to more easily grasp their contribution to Arctic sea ice loss. Figure 7. 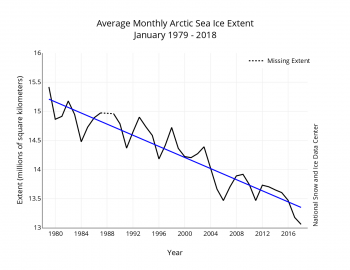 This time series of daily global sea ice extent (Arctic plus Antarctic, month and first day of month on the x axis) shows global extent tracking below the 1981 to 2010 average. Sea Ice Index data. As a result of both Arctic and Antarctic sea ice currently tracking at record low levels, global ice extent near November’s end stood at 7.3 standard deviations below average (Figure 7). However, the processes governing the evolution of sea ice in both hemispheres is a result of different atmospheric and oceanic processes and geographies and it unlikely that record low conditions in the two hemispheres are connected. Also, it is not especially instructive to assess a global sea ice extent because the seasons are opposite in the two hemispheres. In November the Arctic is in its ice growth season while Antarctic is losing ice. 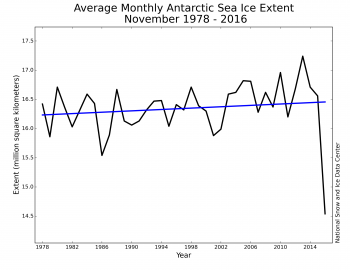 Antarctic sea ice as a whole has slightly increased over the past four decades (but with the last two austral winters having average and below average extent, respectively). 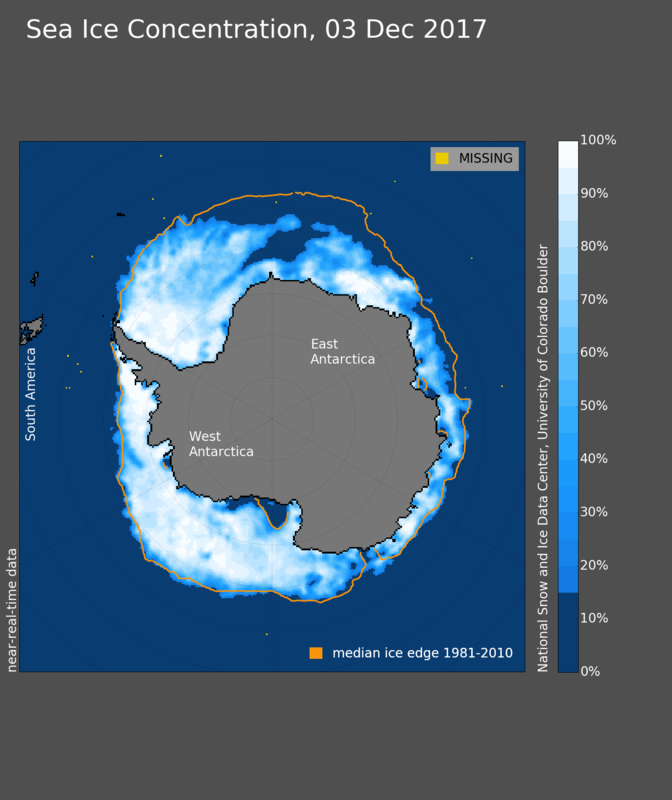 The slight overall increase in Antarctic ice over the satellite record can be broadly linked to wind patterns that have helped to expand the ice cover towards the north (towards the equator). Figure 8. This photograph from Operation IceBridge shows broken floes of sea ice floating in the Weddell Sea. A large area of open water can be seen on the horizon. In October, four NSIDC personnel accompanied the NASA Operation IceBridge campaign on its airborne surveys over Antarctica. 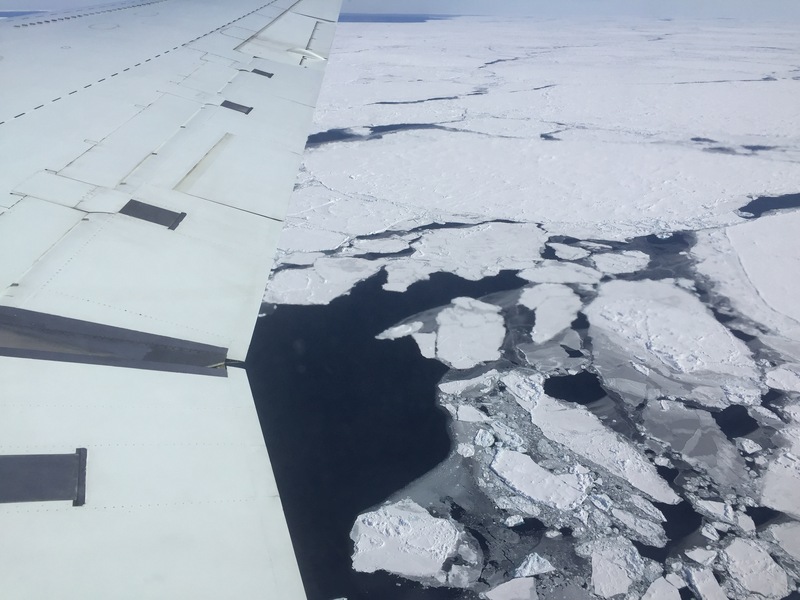 The campaign completed a total of 24 flights over the continent in October and November, covering sea ice, land ice, ice shelves, and glaciers as Antarctica headed into its austral summer. 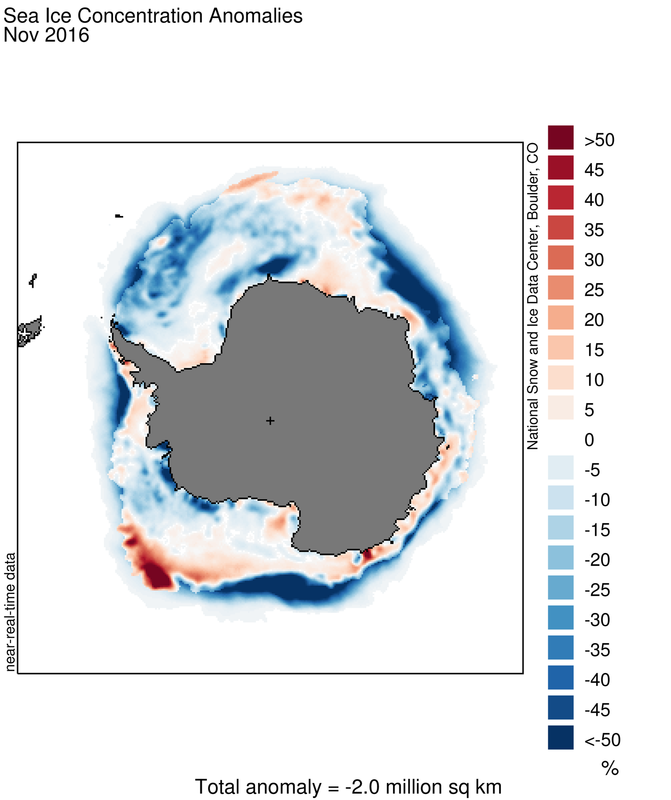 Missions surveyed sea ice in the Weddell and Bellinghausen Seas with instruments that measure both sea ice extent and thickness. These measurements add to a time series of data that measures changes in sea ice and helps researchers assess the future trajectory of the ice pack and its impact on the climate. Visual observations from the flights confirmed that areas in the Bellingshausen Sea that are typically covered in sea ice were open water this year. One of this year’s missions flew over a massive rift in the Antarctic Peninsula’s Larsen C Ice Shelf. Ice shelves are the floating parts of ice streams and glaciers, and they buttress the grounded ice behind them; when ice shelves collapse, the ice behind accelerates toward the ocean, where it then adds to sea level rise. Larsen C neighbors a smaller ice shelf that disintegrated in 2002 after developing a rift similar to the one now growing in Larsen C.
The IceBridge scientists measured the Larsen C fracture to be about 70 miles long, more than 300 feet wide and about a third of a mile deep. The crack completely cuts through the ice shelf but it does not go all the way across it. Once it does, it will produce an iceberg roughly the size of the state of Delaware. The mission of Operation IceBridge is to collect data on changing polar land and sea ice and maintain continuity of measurements between NASA’s Ice, Cloud and Land Elevation Satellite (ICESat) missions. The original ICESat mission ended in 2009, and its successor, ICESat-2, is scheduled for launch in 2018. Operation IceBridge, which began in 2009, is currently funded until 2019. The planned overlap with ICESat-2 will help scientists validate the satellite’s measurements. Notz, D. and J. Stroeve. 2016. 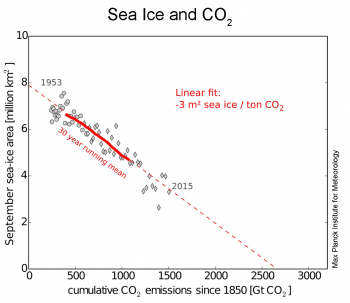 Observed Arctic sea-ice loss directly follows anthropogenic CO2 emission. Science, 11 Nov 2016: Vol. 354, Issue 6313, pp. 747-750. doi:10.1126/science.aag2345. Parkinson, C. 2014. Global sea ice coverage from satellite data: Annual cycle and 35-year trends. Journal of Climate, December 2014. doi:10.1175/JCLI-D-14-00605.1. Fetterer, F., K. Knowles, W. Meier, and M. Savoie. 2016, updated daily. Sea Ice Index, Version 2. Boulder, Colorado USA. 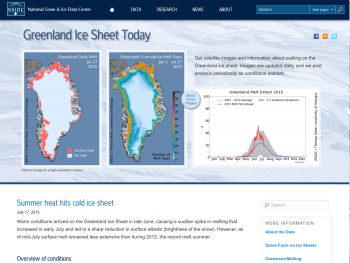 NSIDC: National Snow and Ice Data Center. doi:10.7265/N5736NV7.